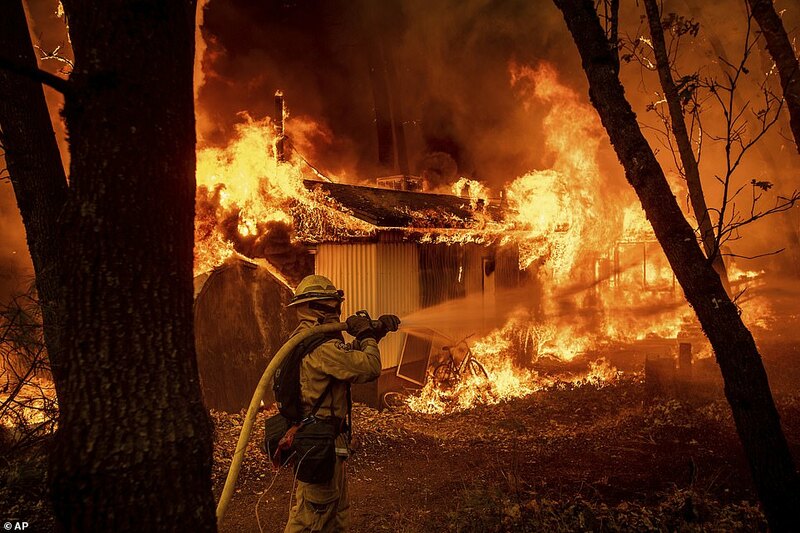 t least nine people have died and 35 are missing in a wildfire in Northern California, while in Southern California thousands of homes are under threat and all of Malibu has been evacuated as two other fires bear down. 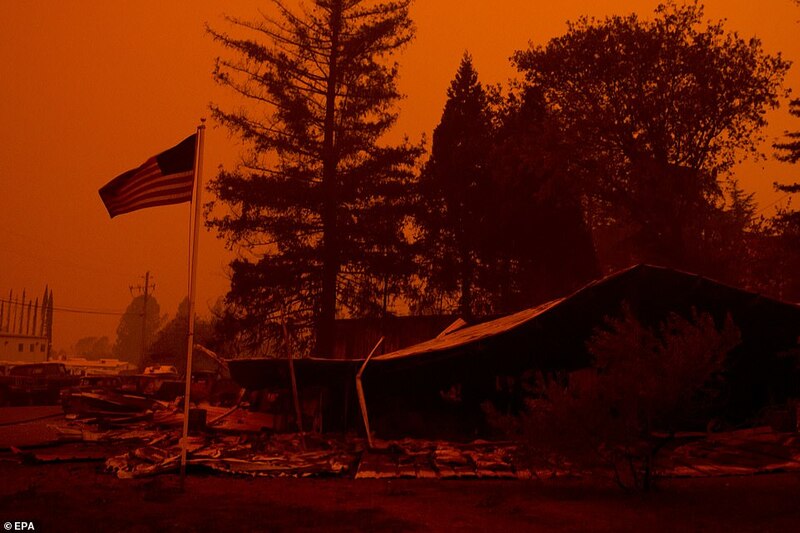 The Camp Fire in Northern California is now the most destructive in state history, after wiping out the town of Paradise. 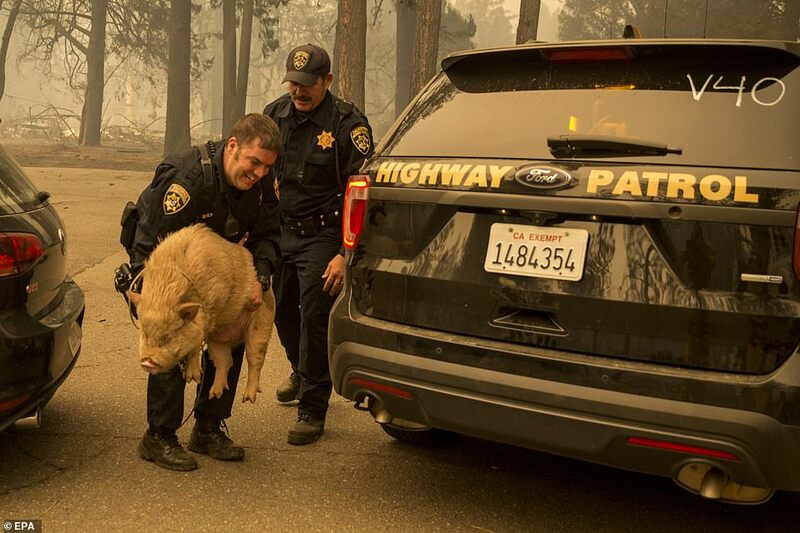 Authorities suspect it may have been started by a malfunction in power lines. 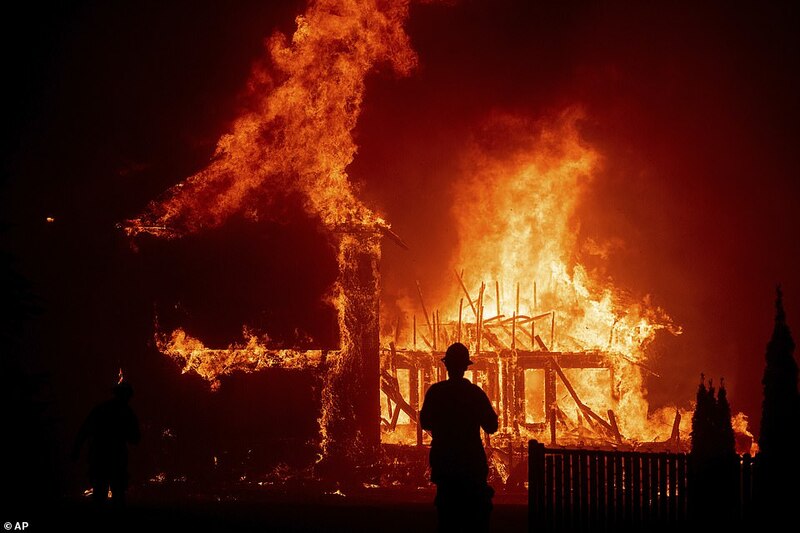 President Donald Trump on Friday evening approved an emergency declaration issuing federal funds to support the battle against the Camp Fire and Southern California's Hill and Woolsey Fires. 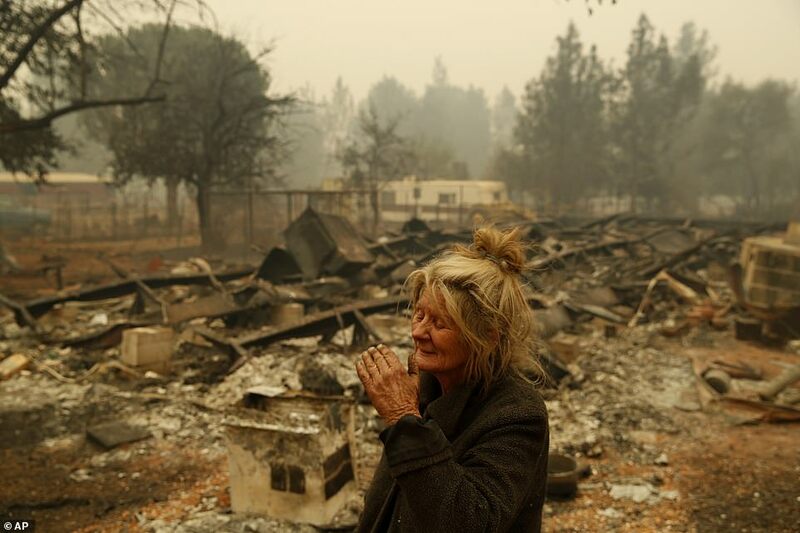 Whipped by the notorious Santa Ana winds gusting up to 60mph, the southern blazes have not yet killed or injured anyone, but have destroyed many homes and forced thousands to flee for their lives on short notice - including many celebrities who live in the wealthy coastal enclaves under threat. 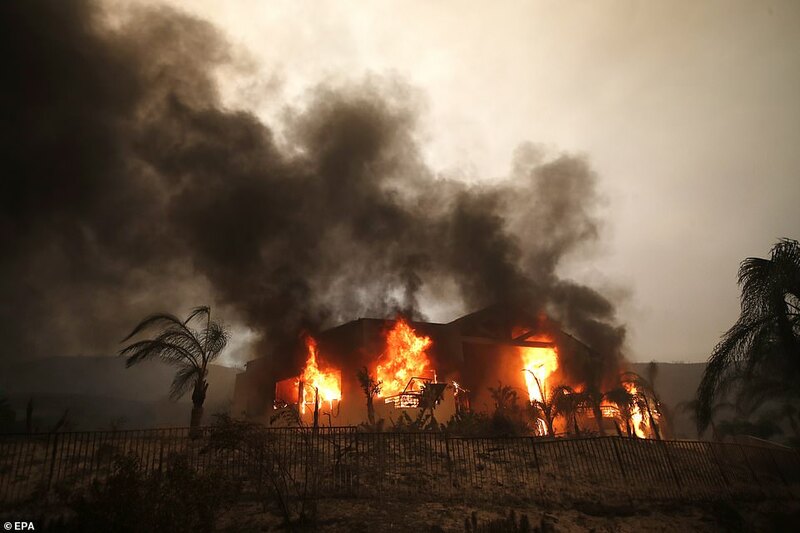 The larger of the two southern blazes, the Woolsey Fire, has scorched as least 35,000 acres north of Los Angeles since igniting near Rocketdyne at around 2pm local time Thursday, quickly spreading southwest toward Newbury Park and Thousand Oaks, the community still reeling from a mass shooting in a bar on Wednesday night. 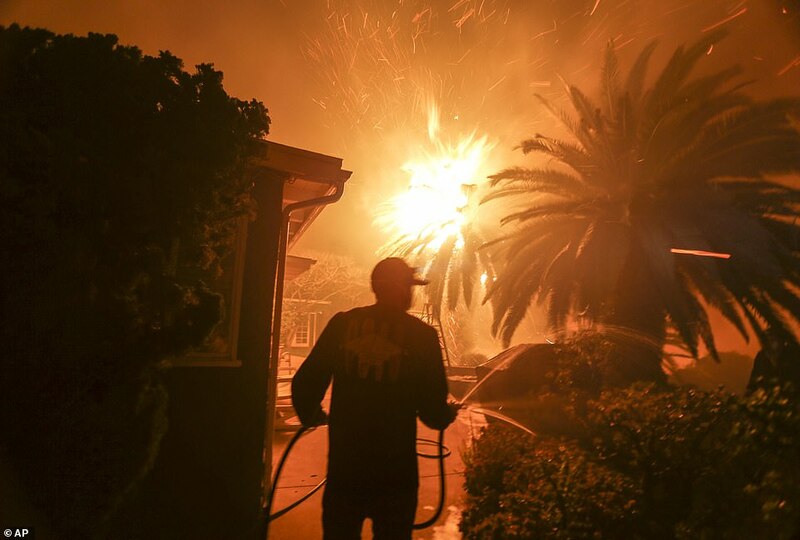 The massive Woolsey Fire was a zero containment on Friday night, and dozens of communities on the border of Ventura and Los Angeles counties as well as the beachside city of Malibu were ordered to evacuate as the flames approached. 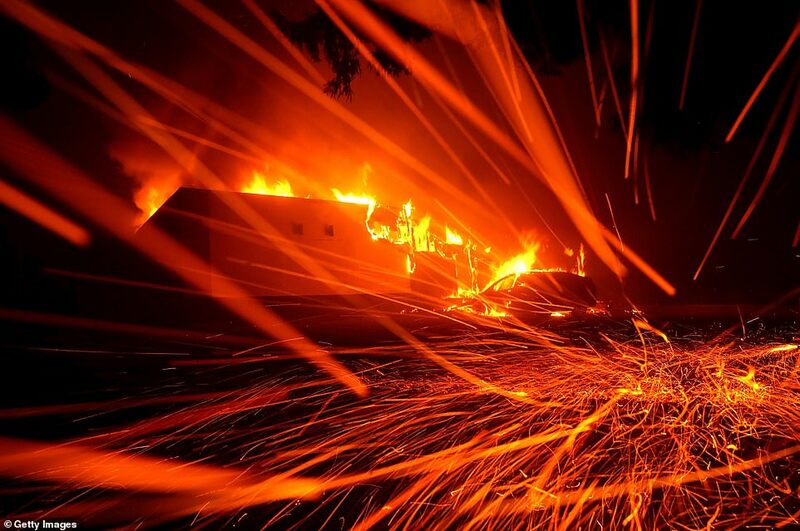 On Friday night, the fire crossed the Pacific Coast Highway, marching straight up to the ocean's edge. 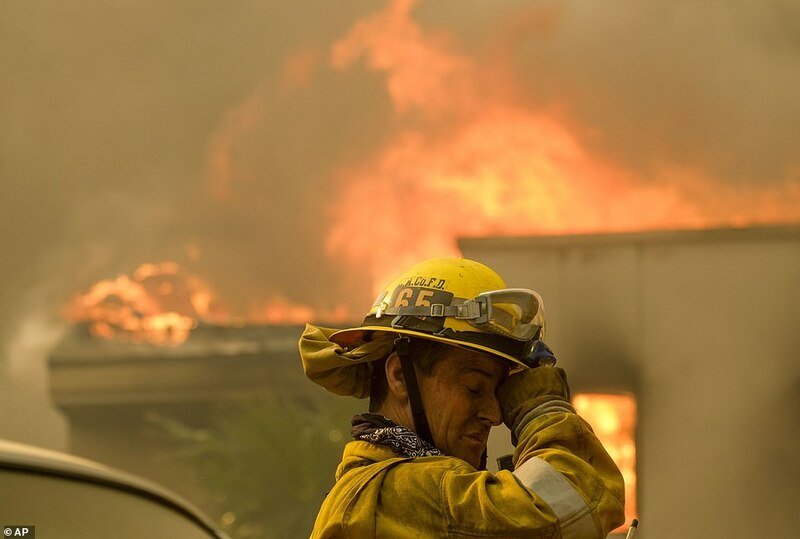 To the west of the Woolsey Fire a second, smaller blaze dubbed the Hill Fire has torched almost 6,000 acres in Ventura County after igniting at around the same time in Hill Canyon on Thursday afternoon. 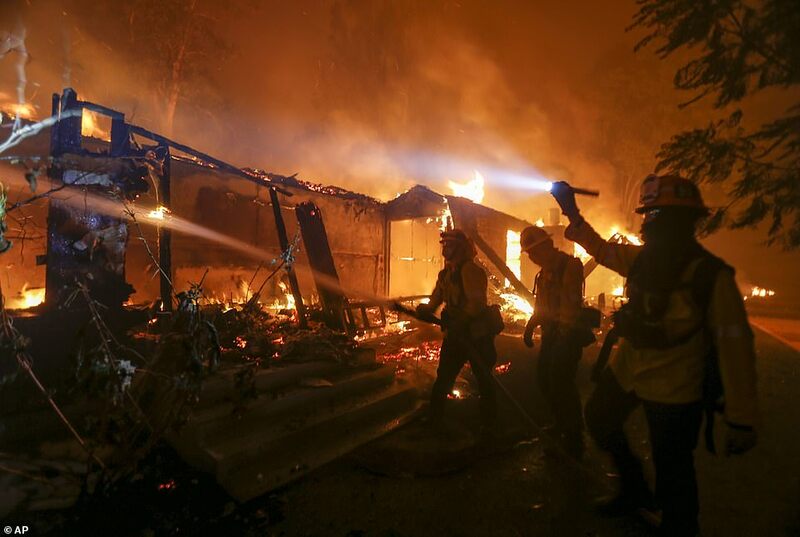 People reported seeing much of the Northern California community of Paradise go up in flames, including homes, supermarkets, businesses, restaurants, schools and a retirement center. 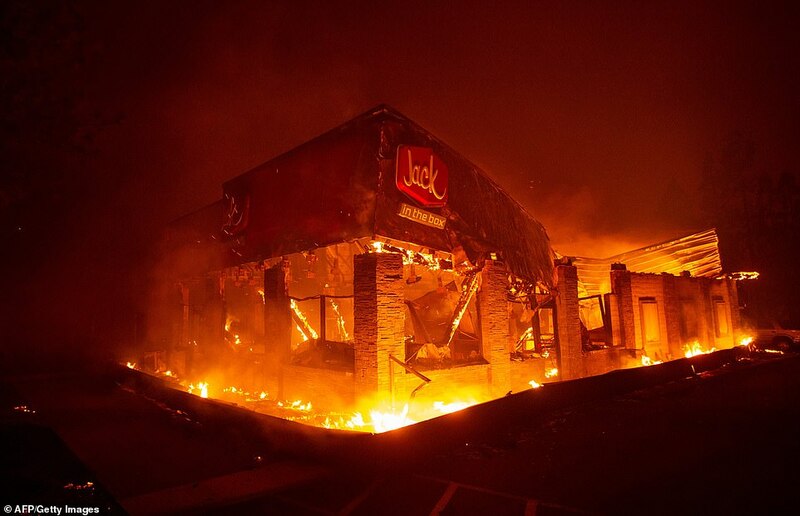 'There was really no firefight involved,' said Capt. 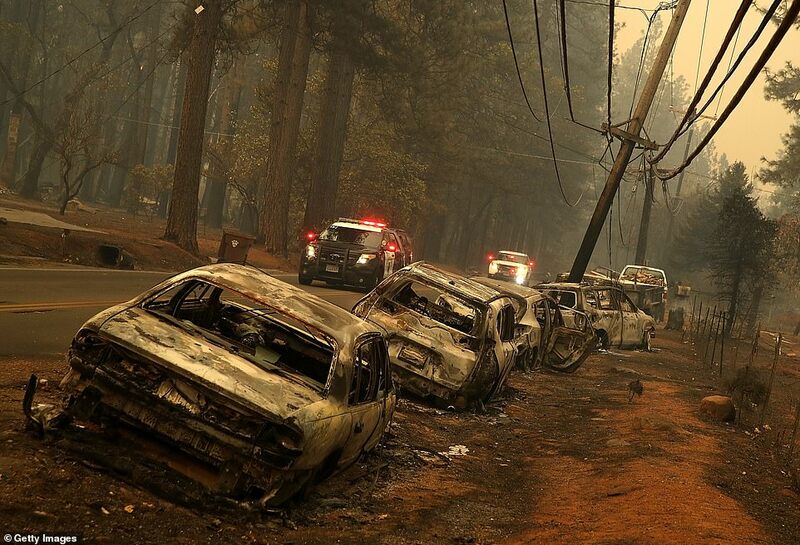 Scott McLean of the California Department of Forestry and Fire Protection, explaining that crews gave up attacking the flames and instead helped people evacuate. 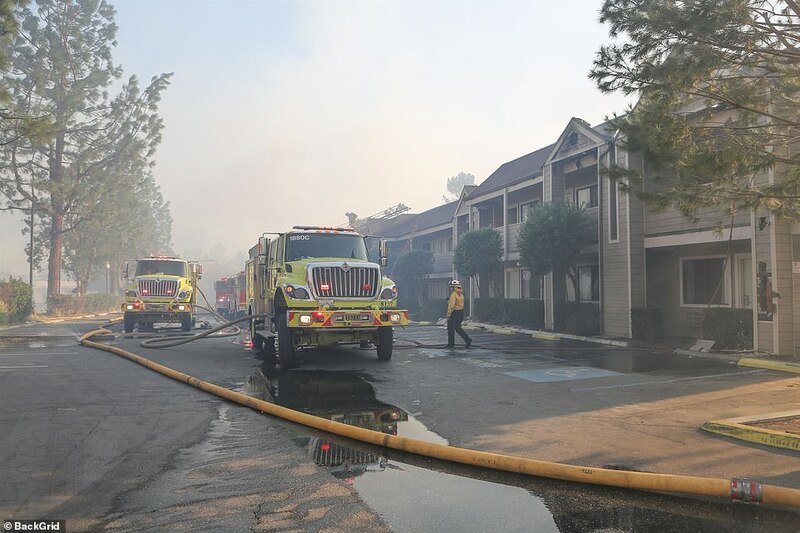 The causes of all three fires are under investigation. 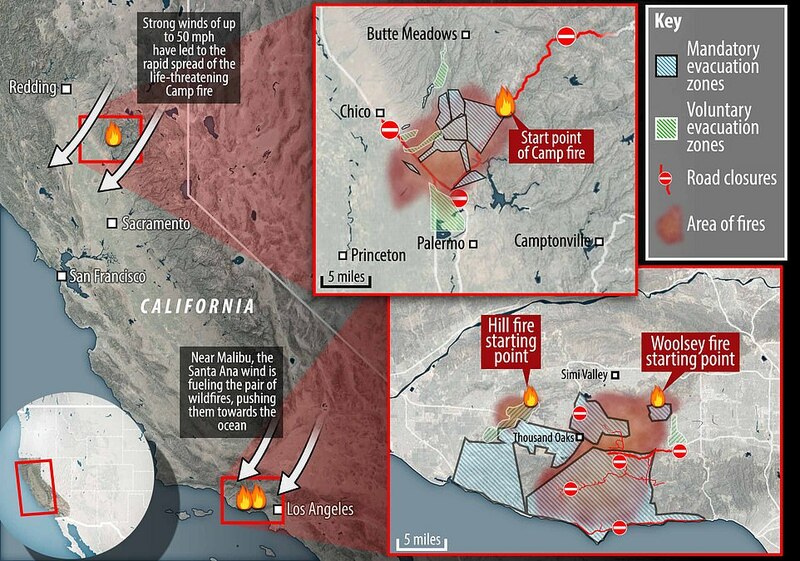 The Camp Fire began at 6.29am on Friday, while in the south the Hill and Woolsey Fires began on Friday afternoon. 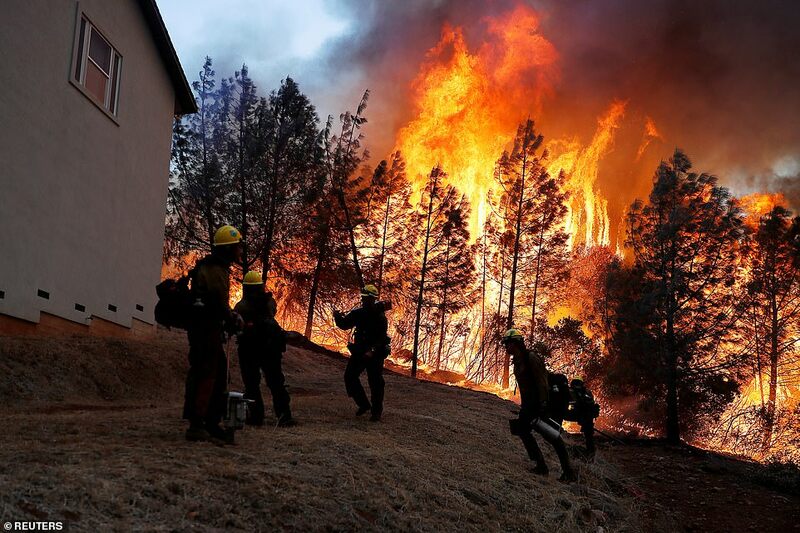 The Camp Fire is 5 per cent contained. 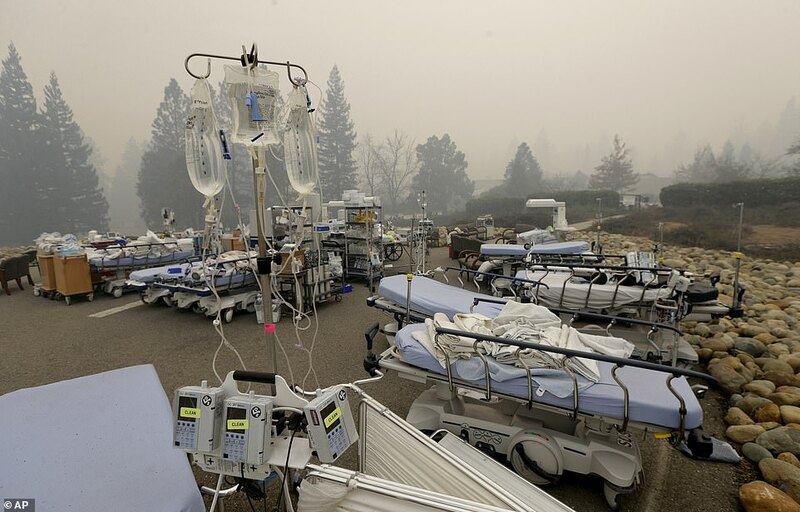 Pacific Gas & Electric Company says it will cooperate with any investigations stemming from the Camp Fire. 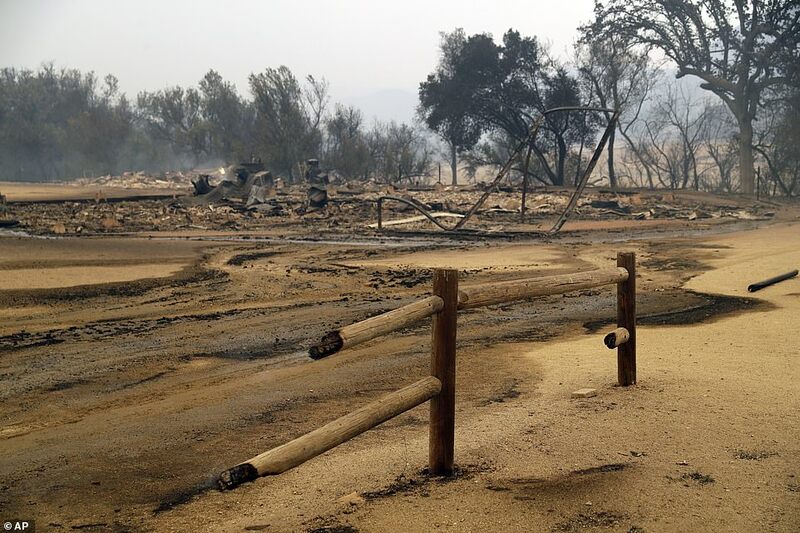 The utility told state regulators on Thursday that it experienced a problem on an electrical transmission line near the site of the blaze minutes before the fire broke out. The company said it later observed damage to a transmission tower on the line. 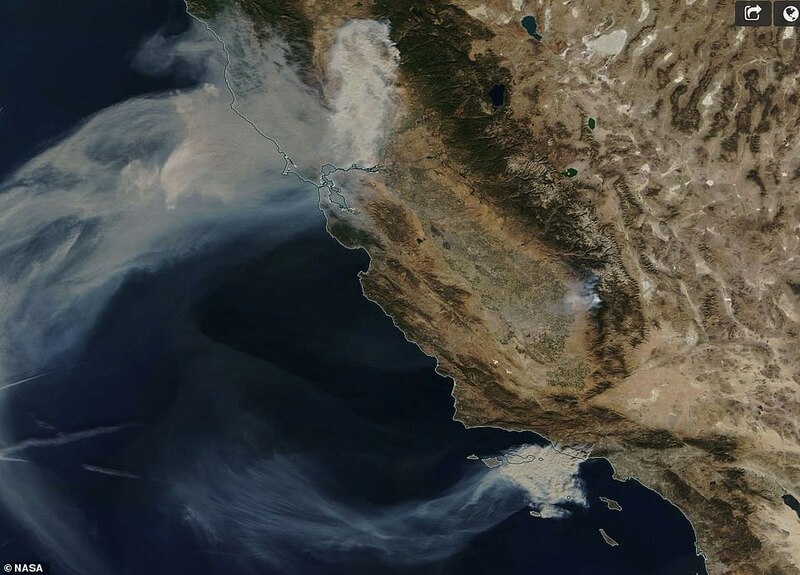 The wildfires come unusually late in the season for California, after a lack of fall rain storms left the region unseasonably dry. 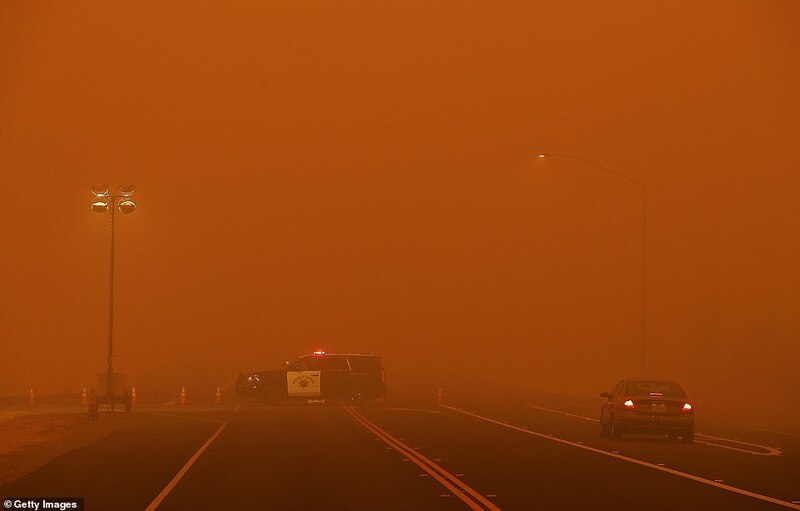 In Southern California, wind alerts and red flag warnings have been issued, warning wind gusts could reach 70mph and relative humidity could be as low as 2 percent. 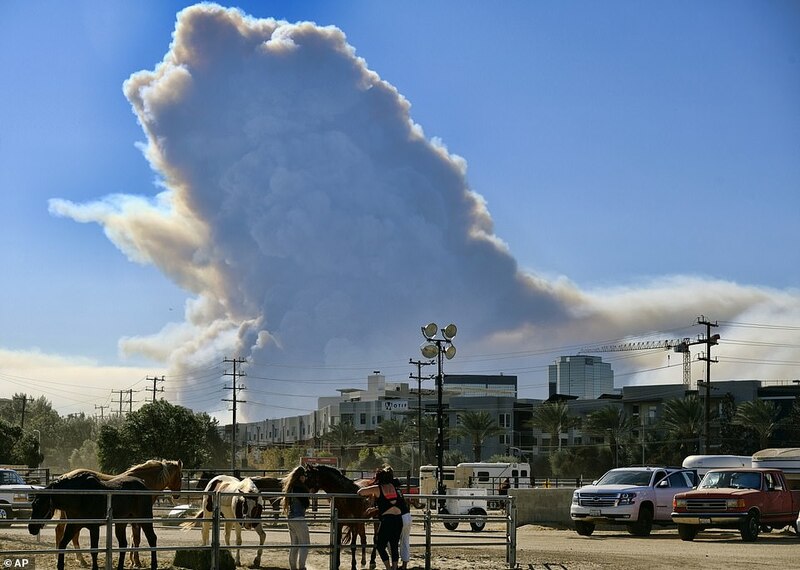 No injuries have been reported in either southern fire as of Friday, but officials have warned that they will remain life-threatening through the weekend. 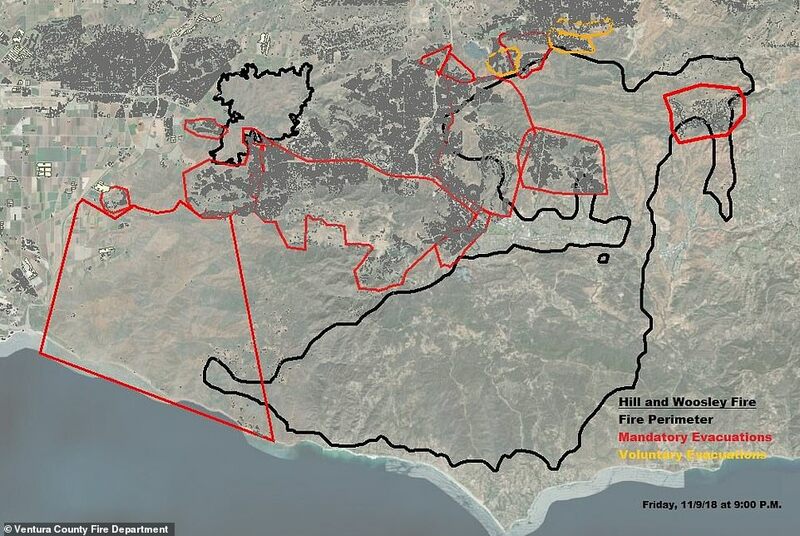 At around 7am local time Friday, officials issued a mandatory evacuation order for the entire city of Malibu as the Woolsey Fire raged toward the Pacific Ocean. 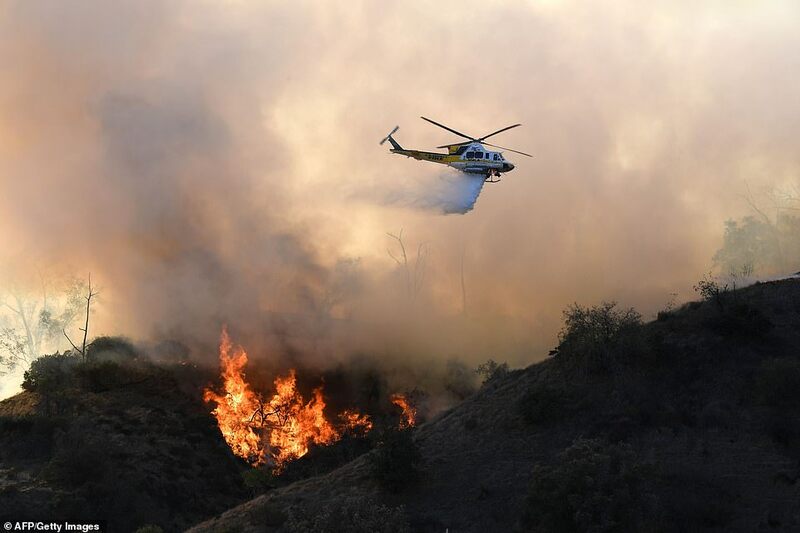 'We're in a situation where this fire is moving quickly - conditions are changing rapidly,' Ventura County Sheriff's Sergeant Buschow said at a press conference. 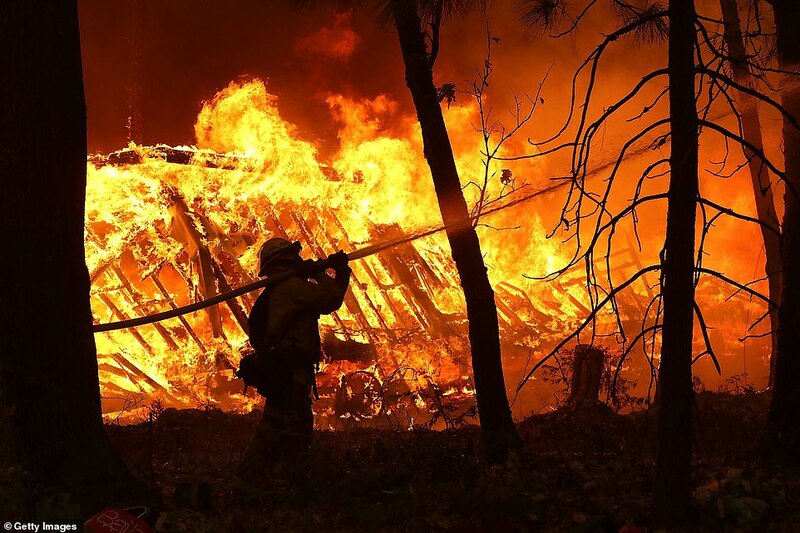 Officials urged anyone who was ordered to evacuate to leave their home without delay in order to clear the way for fire crews to operate. 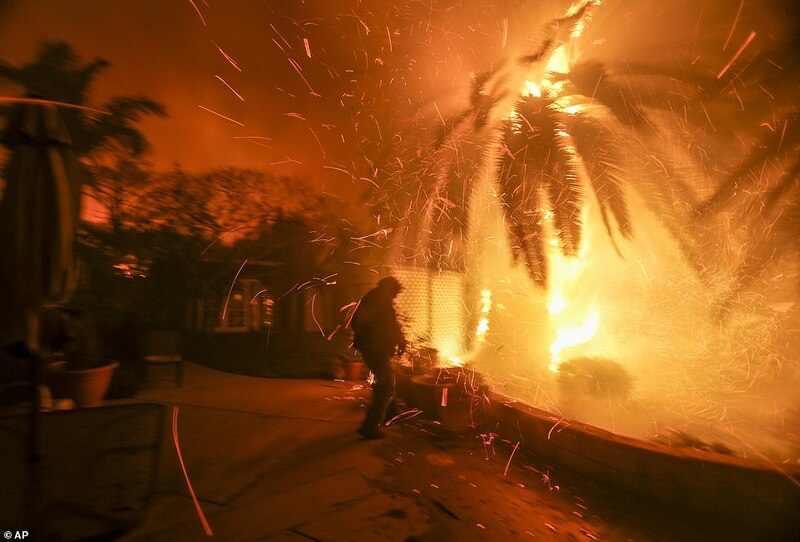 The Woolsey Fire jumped US Highway 101 in the Calabasas area overnight on Thursday and blazed a path into the Santa Monica Mountains. 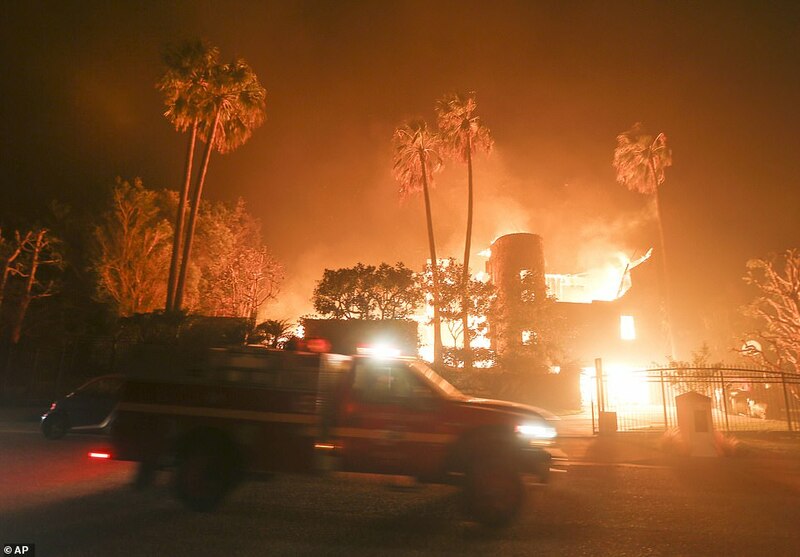 By Friday night, the fire had jumped the Pacific Coast Highway and had a clear path to the ocean. 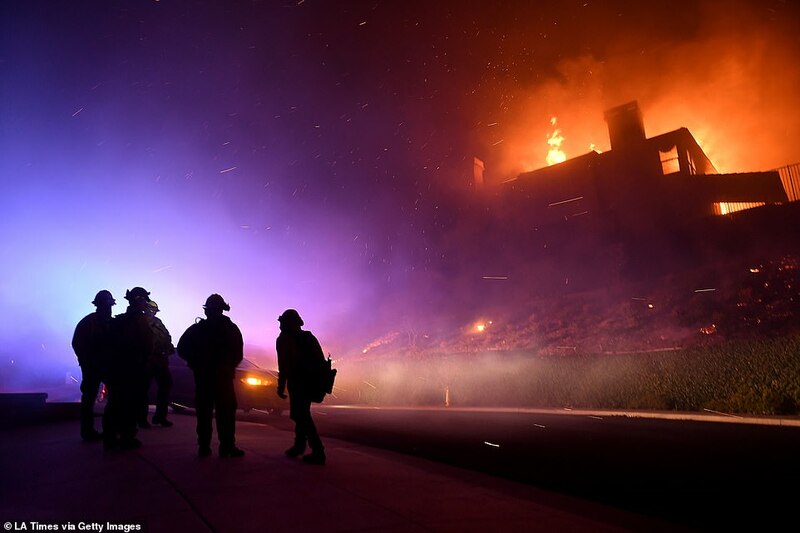 The Southern California fires are flanking the city of Thousand Oaks, threatening the beleaguered community as it tries to mend itself after a gunman stormed a bar holding 'College Night' on Wednesday, killing 12 people and himself. 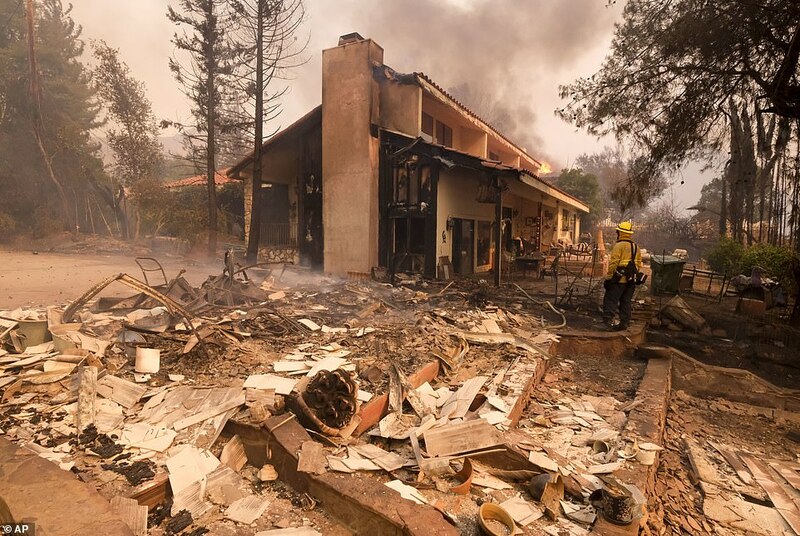 'Just 48 hours ago our city experience tragedy that had national implications,' Thousand Oaks Mayor Andy Fox said at a press conference on Friday night. 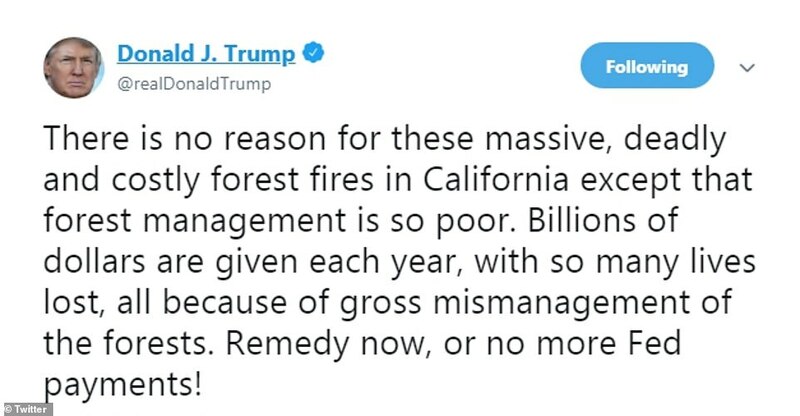 He pointed out that many of those affected by the shooting had probably been forced to evacuate their homes, and noted that the loss of property was never comparable to the loss of life. 'Those lives will never be recovered. 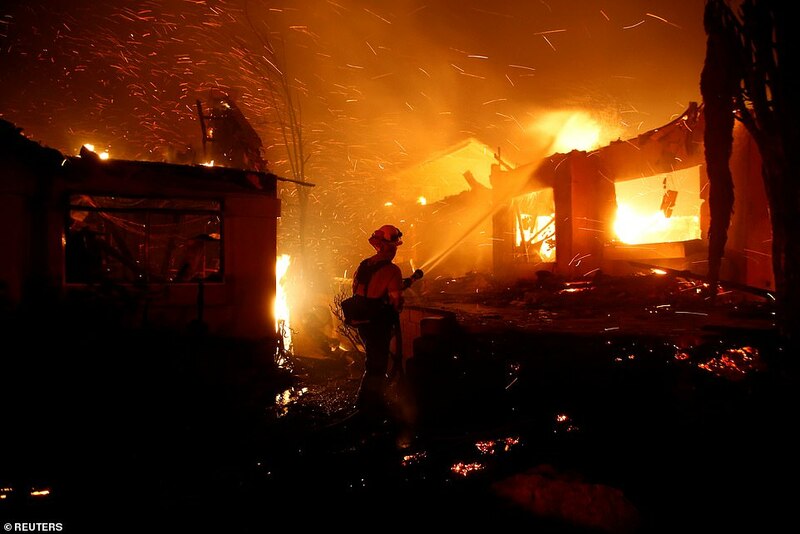 Tonight we are talking about a serious fire situation, but thankfully we have not lost a single life,' the mayor said. 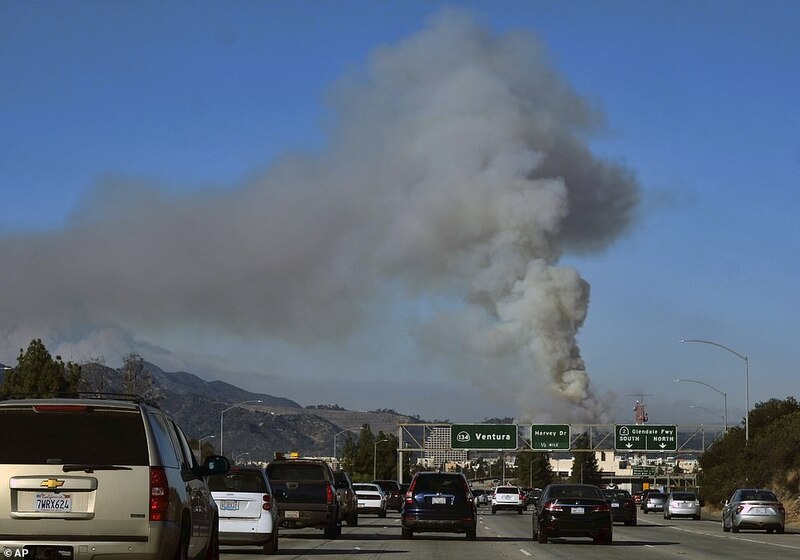 Smoke from the Hill Fire could be seen over the area where a vigil was held last night for the victims of the shooting at the Borderline Bar and Grill less than 24 hours earlier. 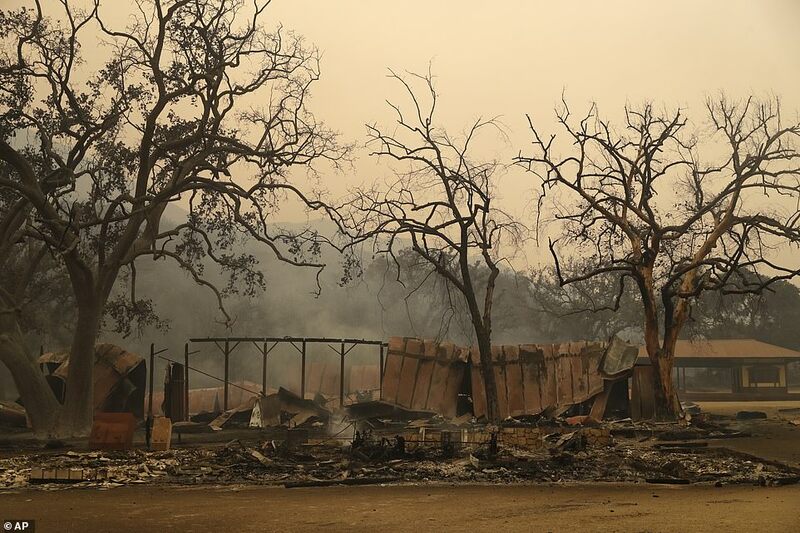 The Thousand Oaks Teen Center that was used as meeting point after the massacre has now been transformed into a shelter from the fire. 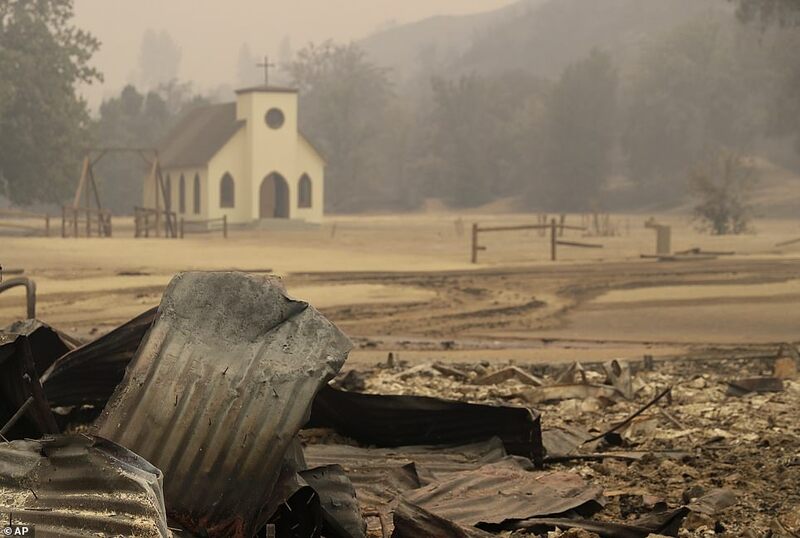 In Agoura Hills, the Woolsey Fire destroyed Paramount Ranch, the set of HBO's Westworld and many other western films and shows. 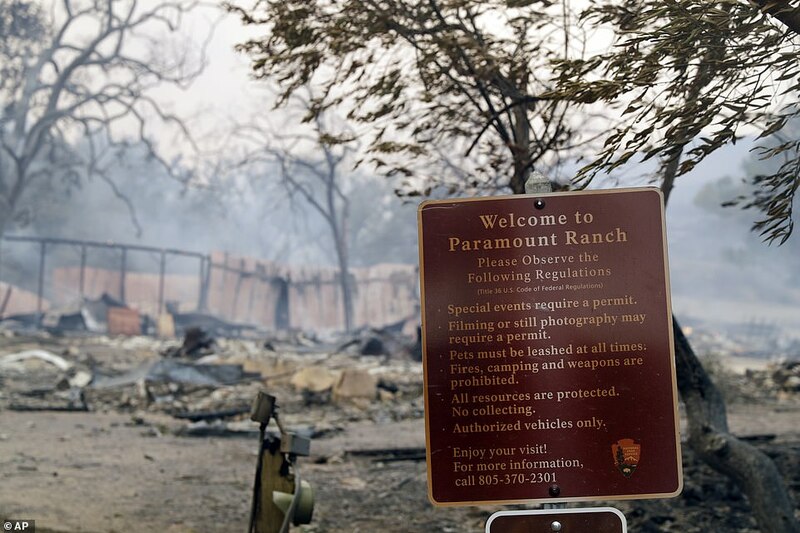 HBO said that no cast or crew were at the Paramount Ranch location when it burned down. Among the films that have been shot at the ranch are Caught in the Draft with Bob Hope, The Lake House with Sandra Bullock, and TV shows including The Mentalist, Weeds and Quickdraw. Dr Quinn Medicine Woman was also shot there from 1992 to 1997. 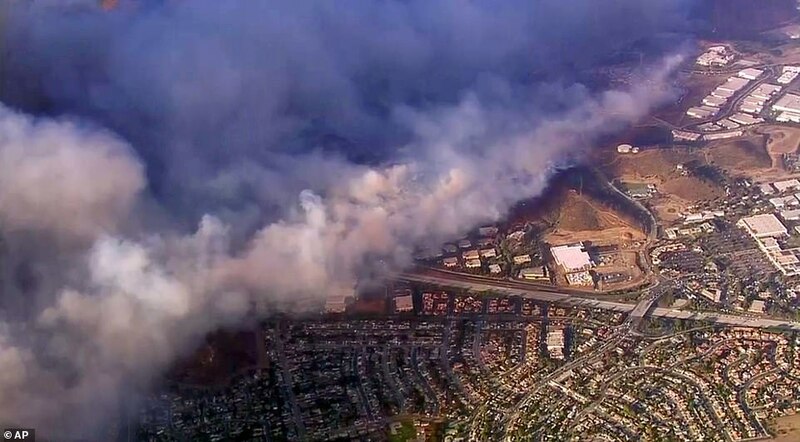 Celebrities including Kim Kardashian and Kanye West, Rainn Wilson, and Alyssa Milano have been forced to evacuate as the flames surrounded their homes. 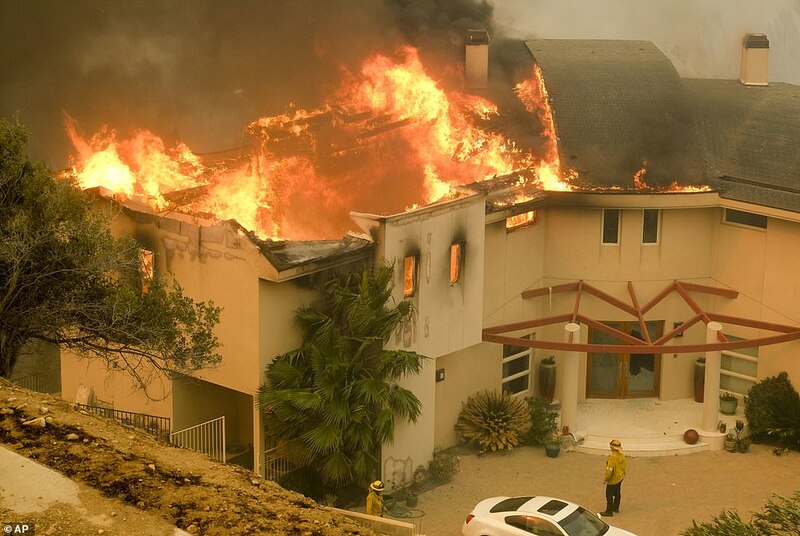 West's offices in Calabasas also had to be evacuated after the raging wildfire encroached on the area. 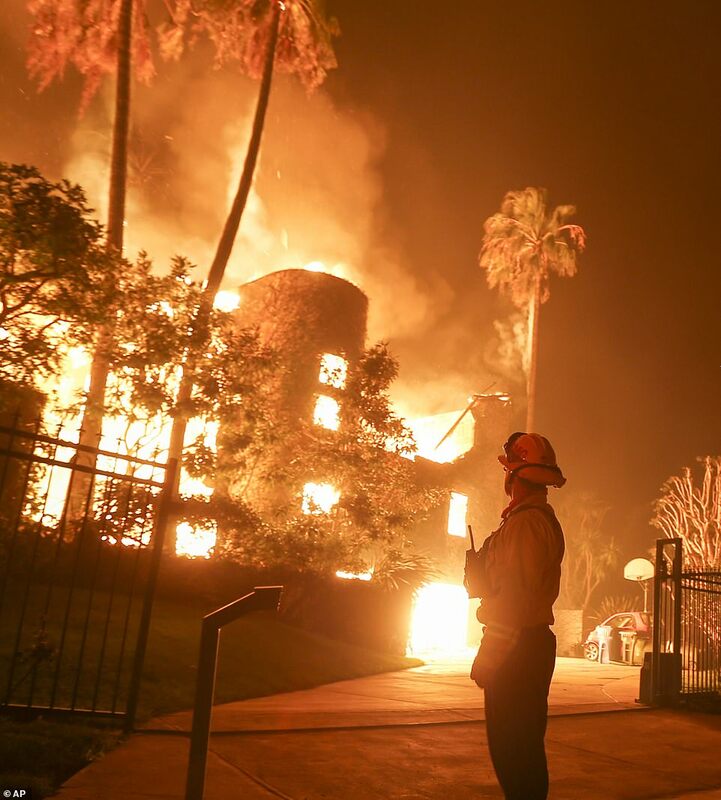 Around the same time reports emerged that Caitlyn Jenner's 3,500 square foot, 4-bedroom pad overlooking the Malibu beach was destroyed by fierce flames from the same blaze. 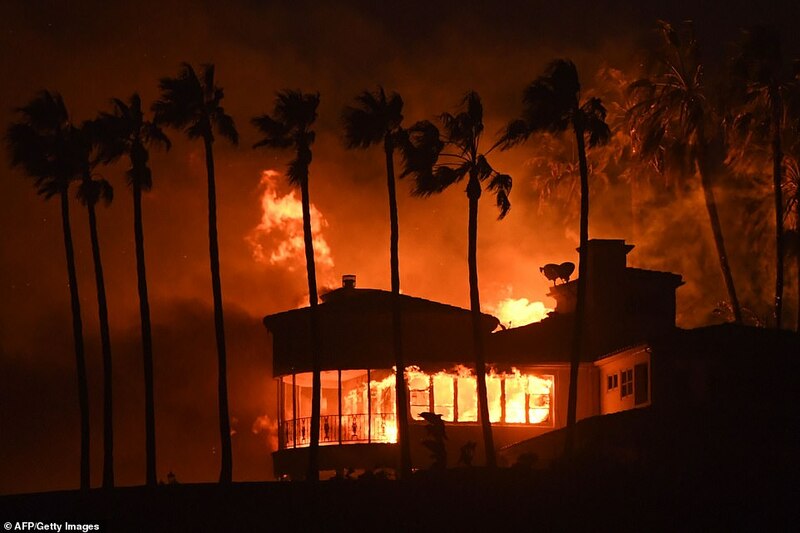 Meanwhile, Lady Gaga's mansion nearby in Malibu was seen surrounded by a blanket of thick smoke as the wildfire overtook the beachside city before moving toward Oxnard. 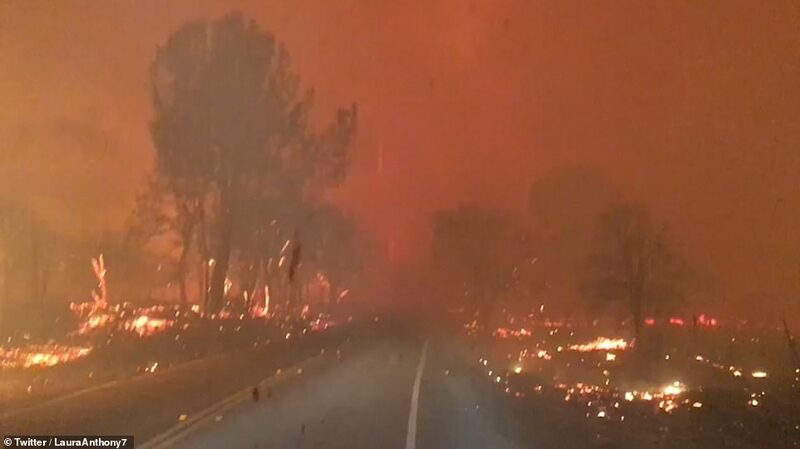 Will Smith posted a video to his Instagram story expressing worry that his own home would be hit by the flames as the path of destruction continues. 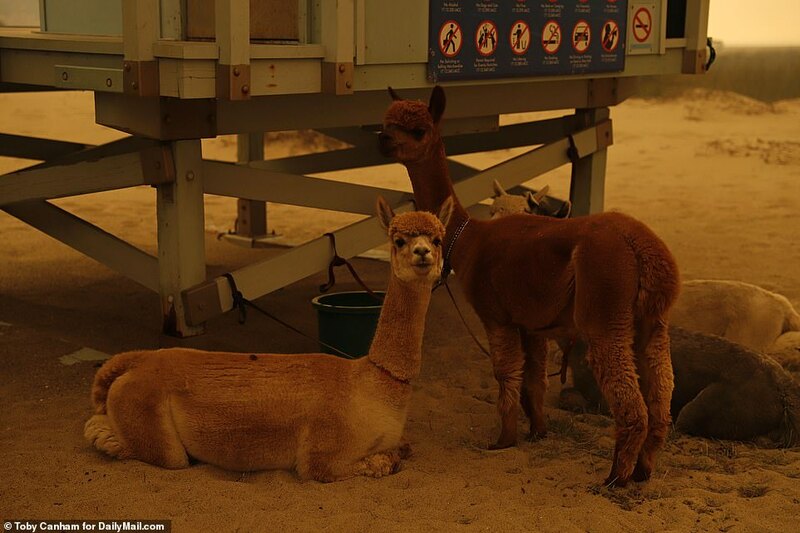 Actor Charlie Sheen posted a message on Twitter on Friday evening saying that he had not heard from his parents, Martin and Janet Sheen, since they fled Malibu for a staging area at Zuma Beach. 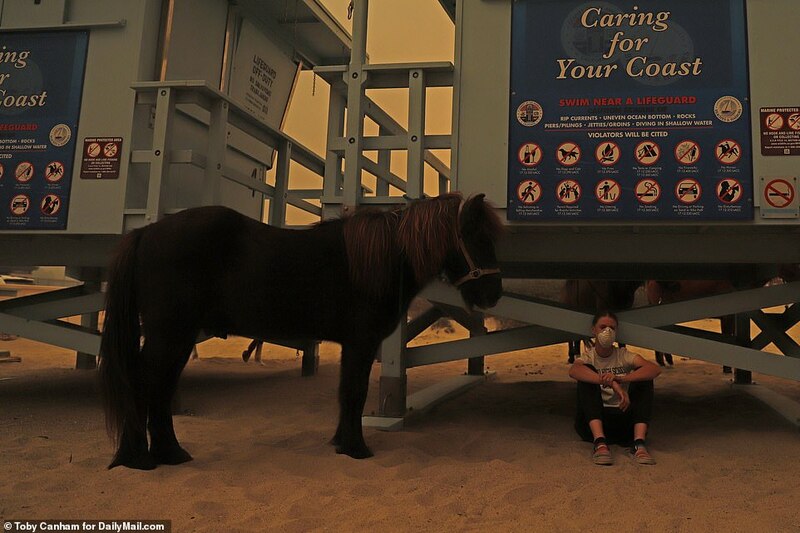 There were reports of hundreds of people trapped between the flames and the ocean at Zuma Beach, an evacuation zone for large animals, with no food or shelter and escape routes cut off. 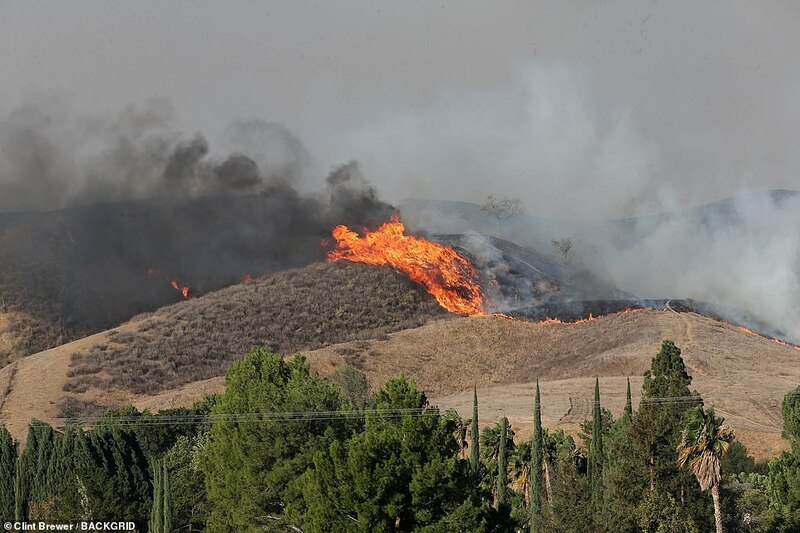 The fire has been spread by powerful winds that pushed it through canyons and to the edge of Camarillo Springs and Cal State Channel Islands, both of which were evacuated. 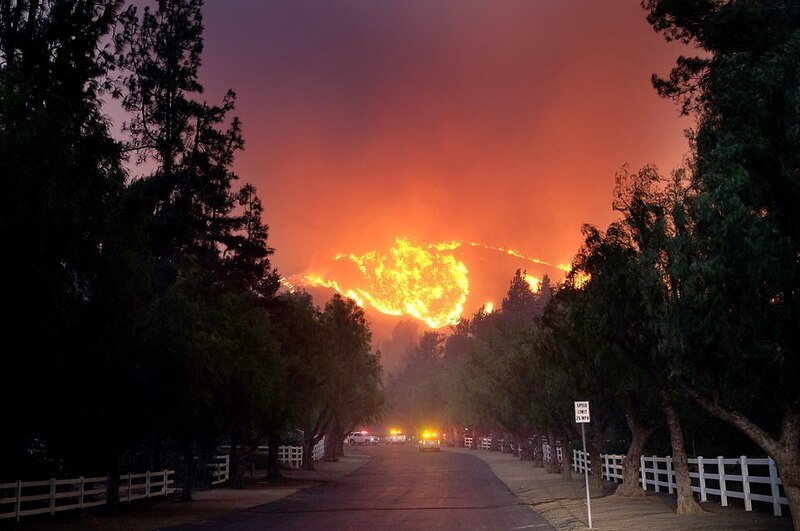 More than 165 firefighters were rushed to the area and eight aerial air tankers have been ordered to tackle the fierce blaze from above. A 'red flag' warning came into effect at 10am today in the San Diego County mountains and valleys and will last until 10pm Friday. 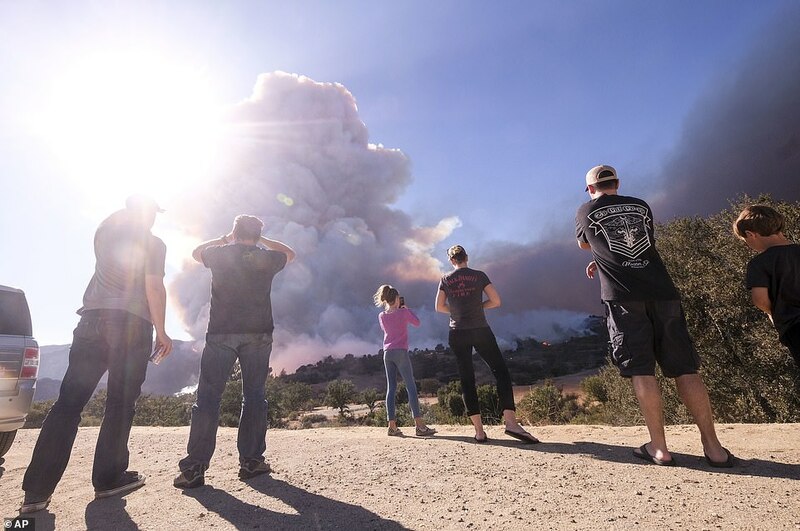 In nearby Newbury Park where ex-marine Ian Michael Long lived, residents stood and watched two scenes unfolding - one of reporters standing outside of home of the suspected shooter, the other a brush fire raging behind their homes. 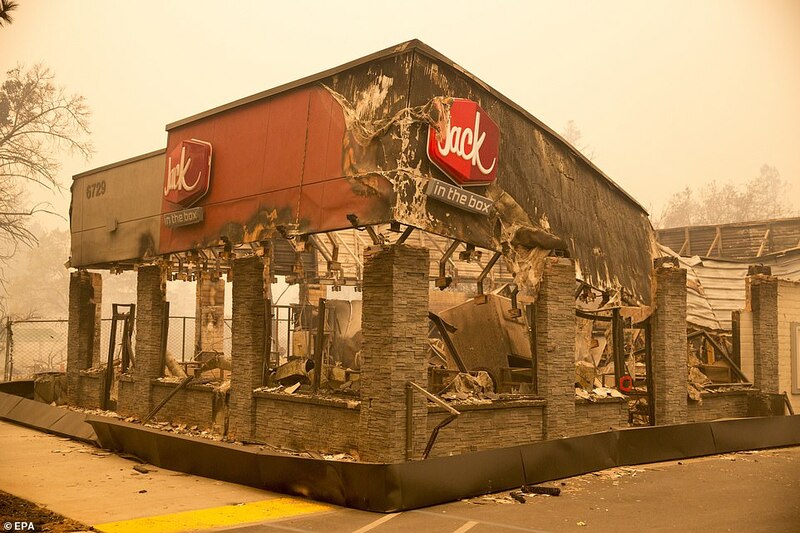 This morning the flames were said to be only three miles from the Borderline Bar and Grill. 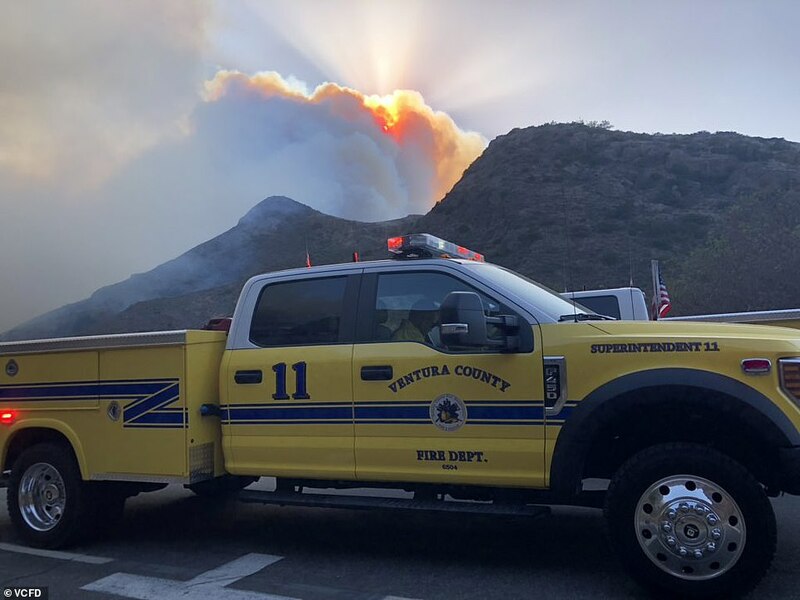 The Hill Fire is burning in the same area as the Springs Fire from 2013, according to the Ventura County Fire Department. 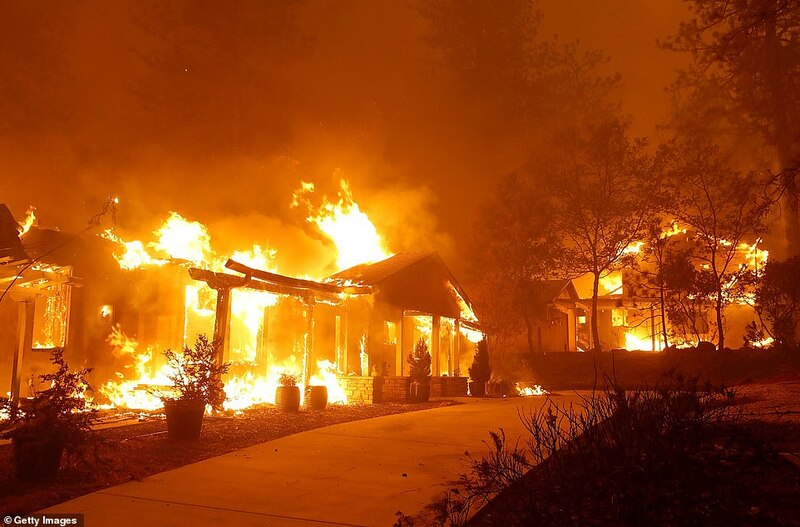 Kim Kardashian and her three children were given just one hour to evacuate her home as wildfires swept through California. The reality TV star flew back from San Quentin jail, where a death row inmate she is campaigning to have released is being held, when she was told to quickly flee the devastating blazes. 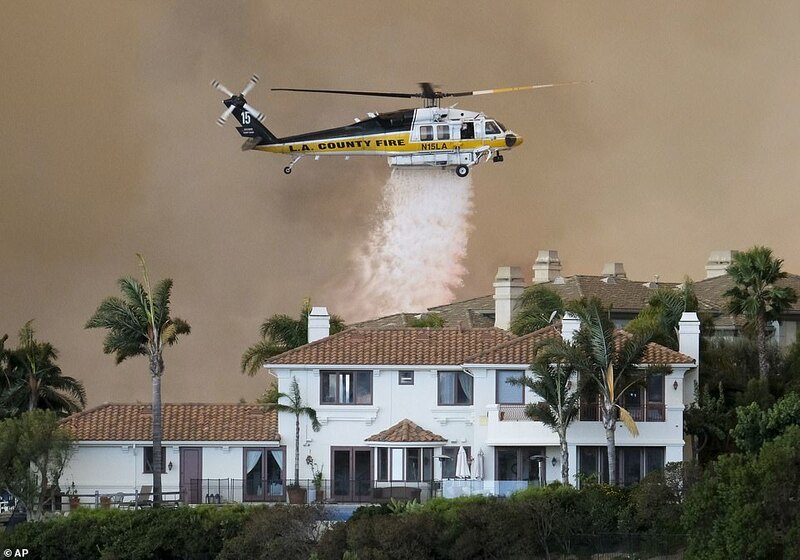 As the 38-year-old came into land in her private plane she took aerial videos and pictures of the flames spreading around the around Los Angeles and Ventura County. 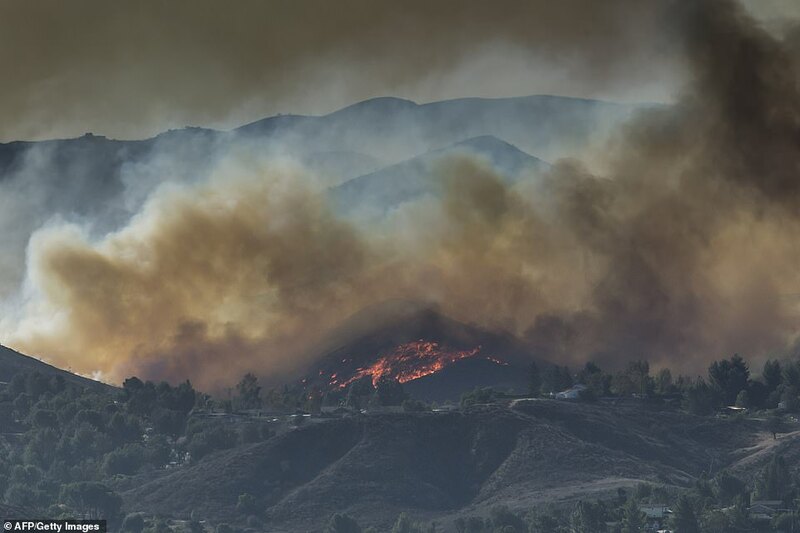 The star has asked her fans to 'pray for Calabasas' after the reality TV star was 'evacuated' from her home due to wildfires. 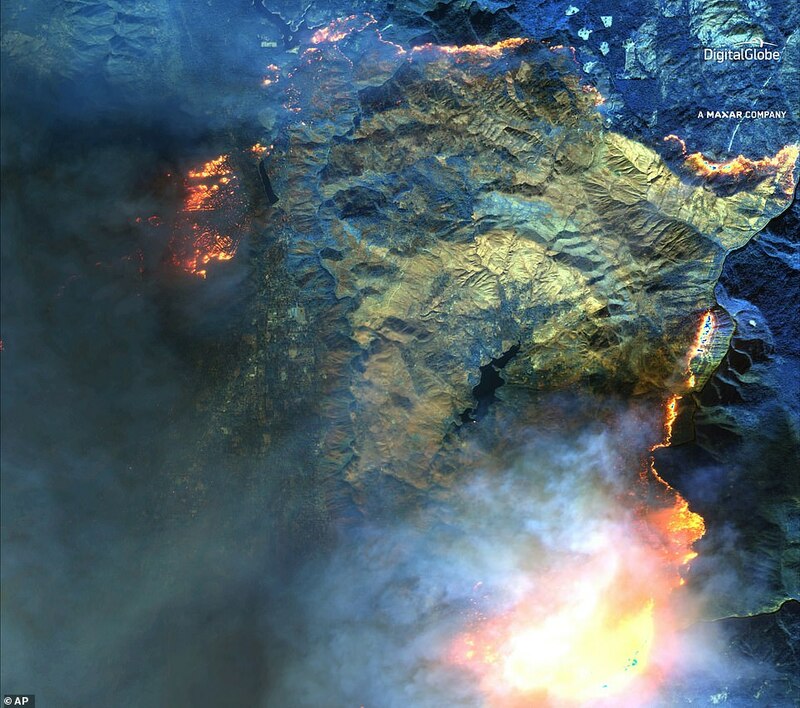 She took to Instagram to share aerial photos of the Woosley fire in California and praise the efforts of firefighters. 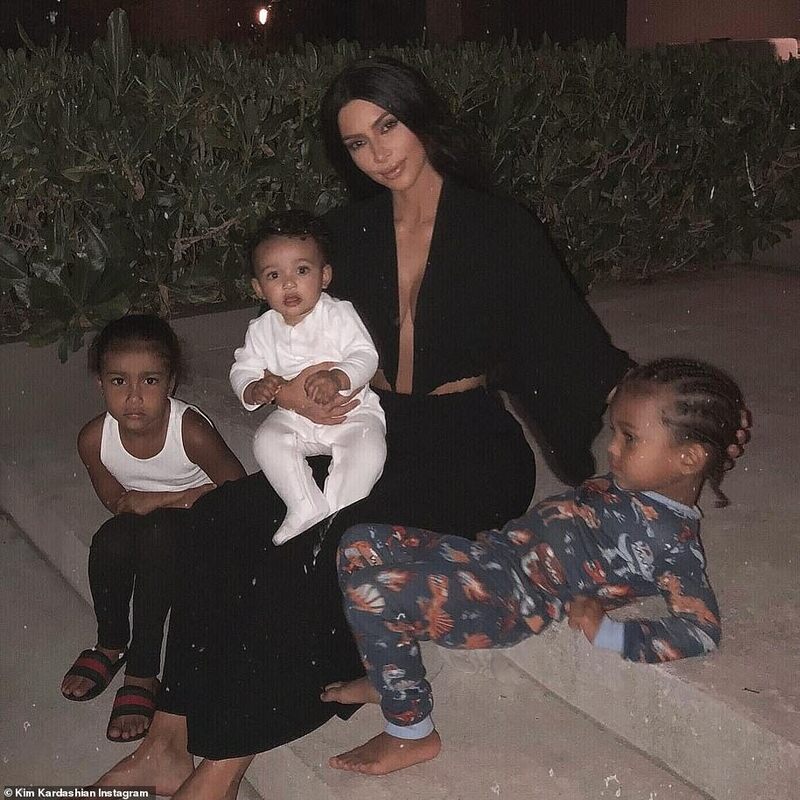 However once she landed, Kim revealed her and kids North, Chicago and Saint only 'had 1 hour to pack up & evacuate our home'. 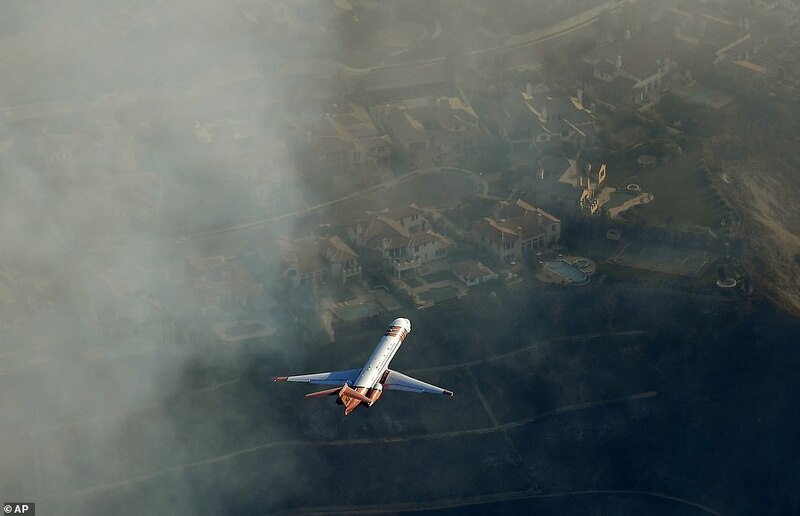 The socialite was returning from a business trip when she spotted the fires from the air. And once on the ground, Kim made sure to document the action, sharing pictures and videos of first responders to the tragedy. 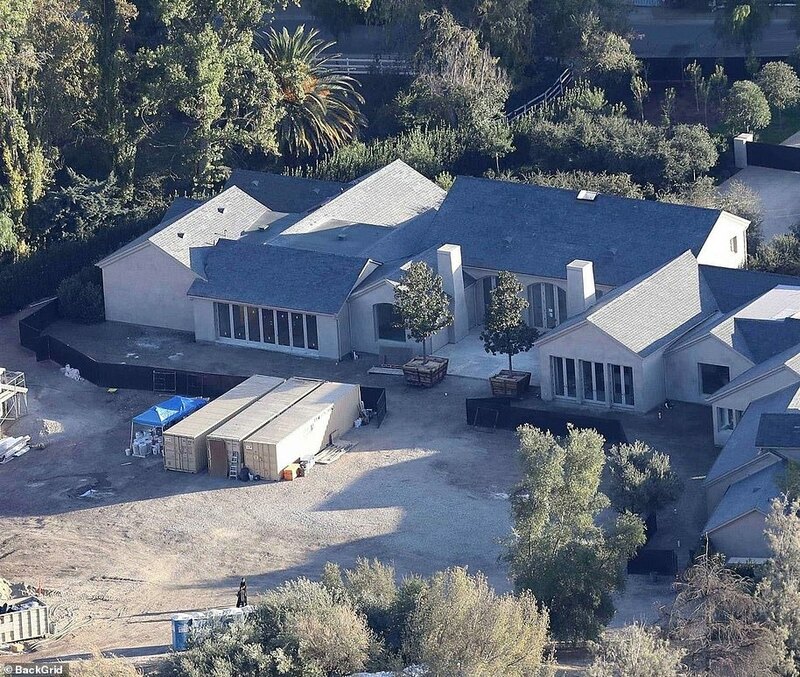 Kim and rapper Kanye West's 15,000 sqft estate in Hidden Hills is thought to be worth around $20million. 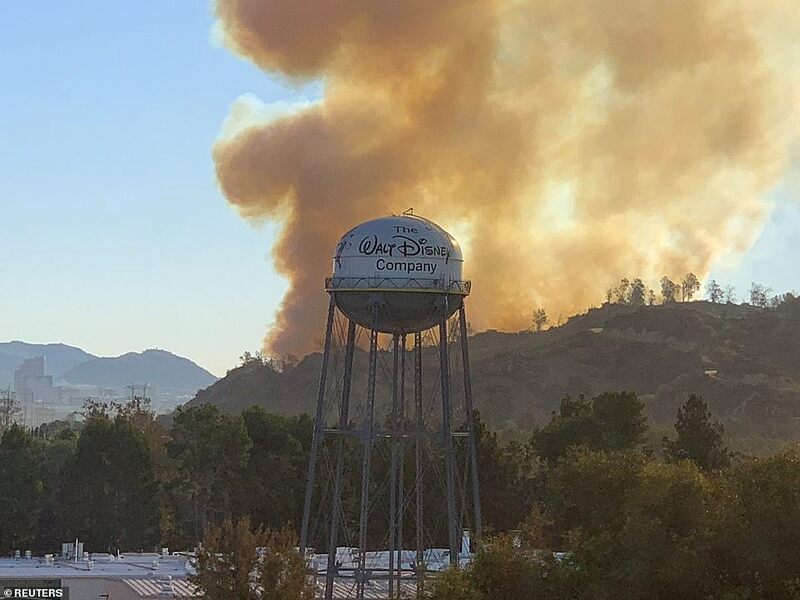 The fire first erupted on Thursday afternoon east of neighboring city Chatsworth and has since grown to 4,000 acres in Ventura County. 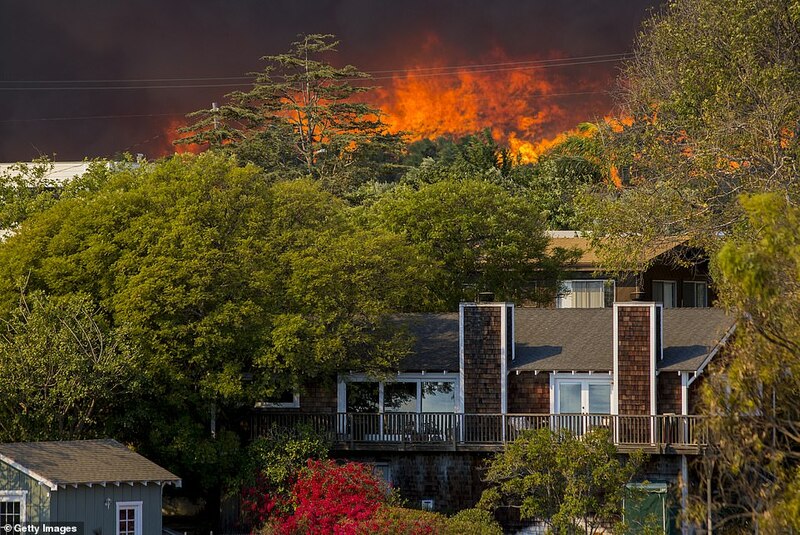 It rapidly burned down several houses as mandatory evacuations were ordered in areas like the Kardashian neighborhood of Hidden Hills. 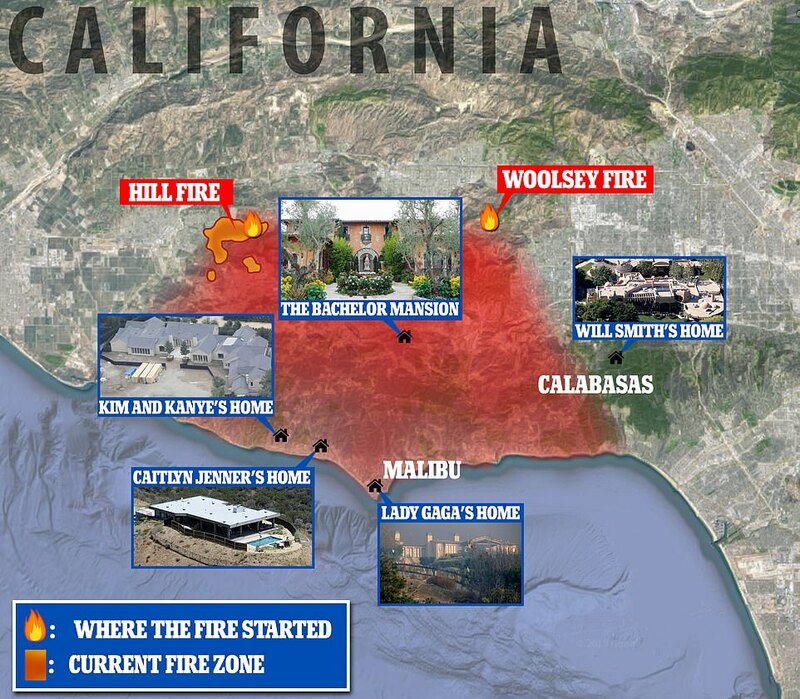 Kim and her sister Kourtney, 39, both live in exclusive Calabasas, near their mother Kris Jenner and brother Rob. Kourtney left her Calabasas home and posted an Instagram picture of suitcases in her car as she went to stay with sister Kendall Jenner's house in Beverly Hills and joked she was raiding her pantry for food. 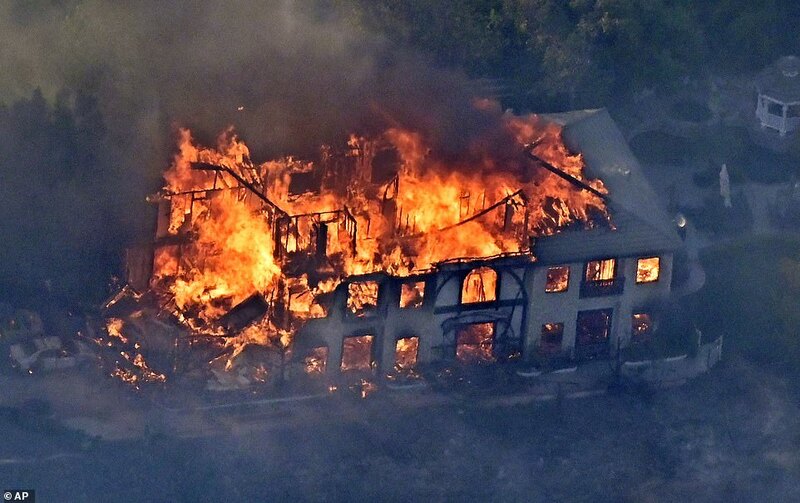 Kris Jenner's upmarket Hidden Hills neighborhood was evacuated, but she was also not at her $9.9m home as the drama unfolded as she was watching daughter, Kendall, take to the catwalk and star in the Victoria Secrets fashion show in New York. Kylie was not in California at the time as she was supporting boyfriend, Travis Scott, at his Astroworld tour in Baltimore, Maryland. Khloe Kardashian revealed that she and daughter True were staying with Rob Kardashian and his daughter, Dream, who live near Kris, but were not forced out of their home. 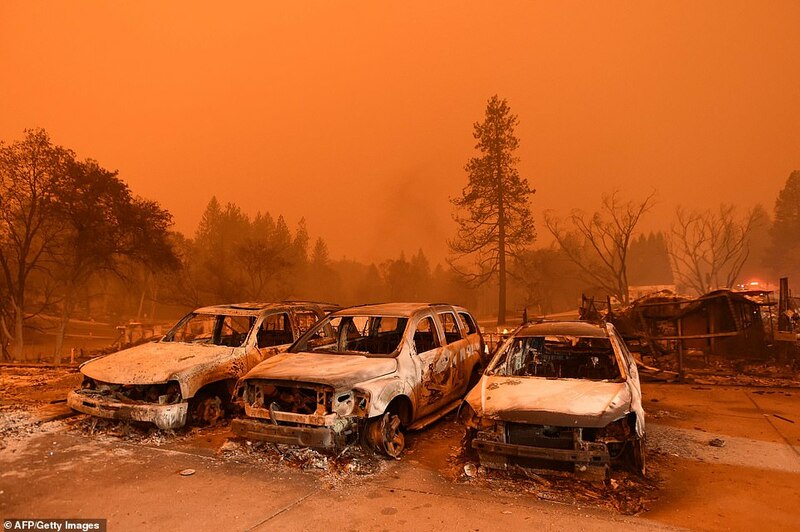 On Friday officials confirmed that five people had been found dead in their vehicles after having been burnt alive by ferocious flames in Northern California's Camp Fire. 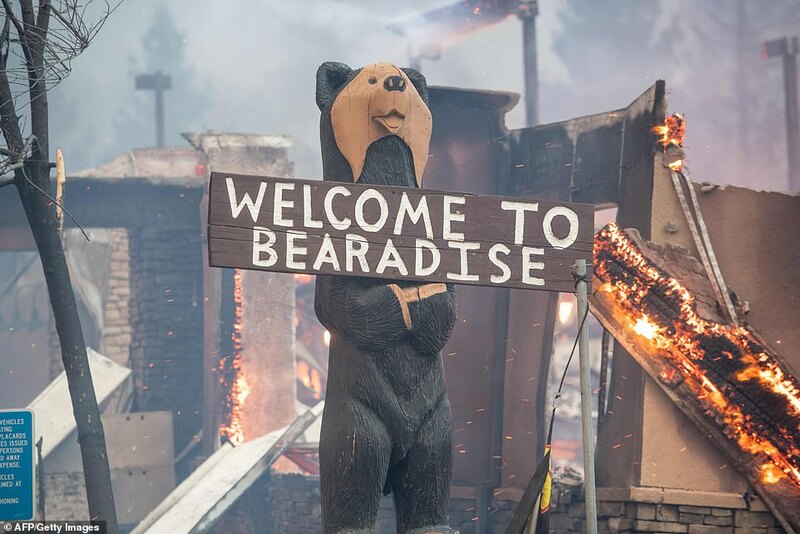 In the northern part of the state, the town of Paradise has been 'pretty much destroyed' by a raging wildfire that forced some 27,000 terrified residents to flee their homes. 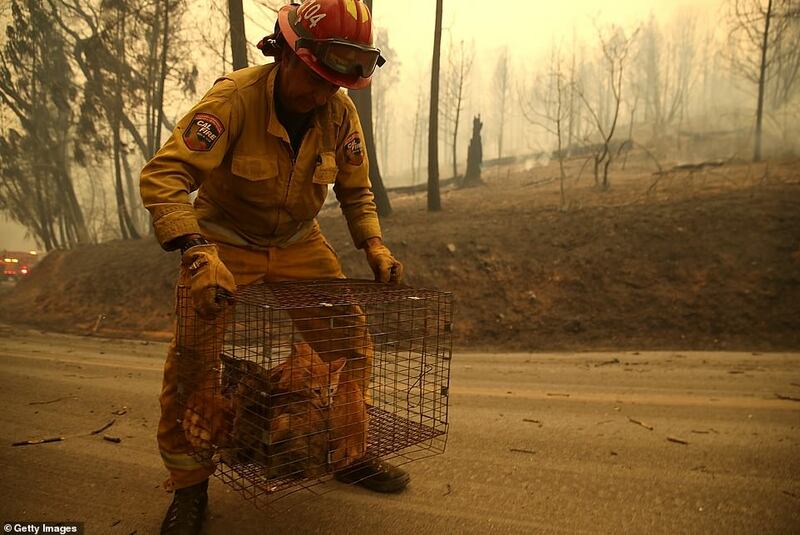 Evacuees were seen clutching babies and pets as they abandoned vehicles and struck out on foot ahead of the blaze that engulfed the town, destroying hundreds of buildings and causing highway pylons to collapse into roads. 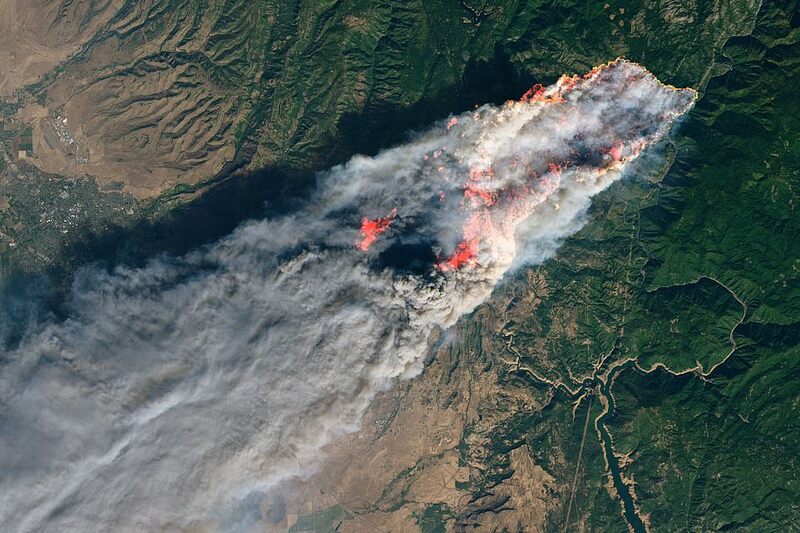 [ltr]Towering "firenado" seen swirling amid the #CampFire that has scorched at least 20,000 acres in Northern California. 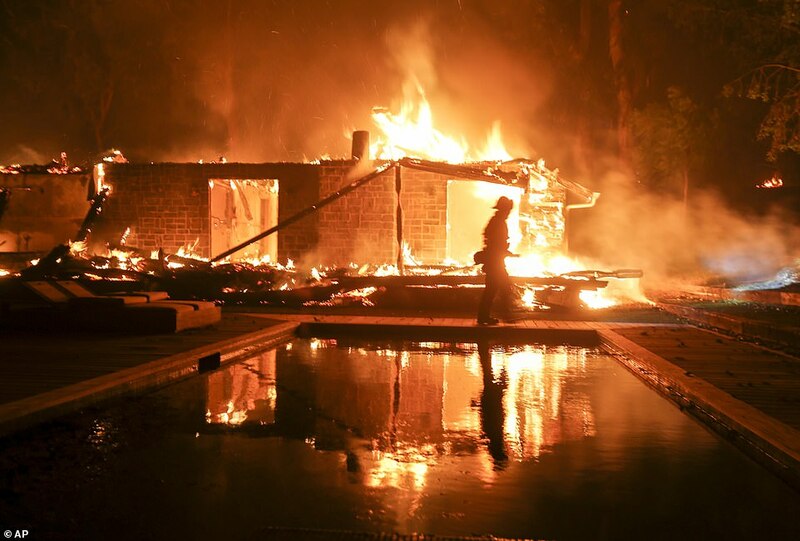 As a vicious wildfire rages through Northern California, the warning to flee came to one woman in the form of a small 'ominous' piece of charred paper that descended from the sky. 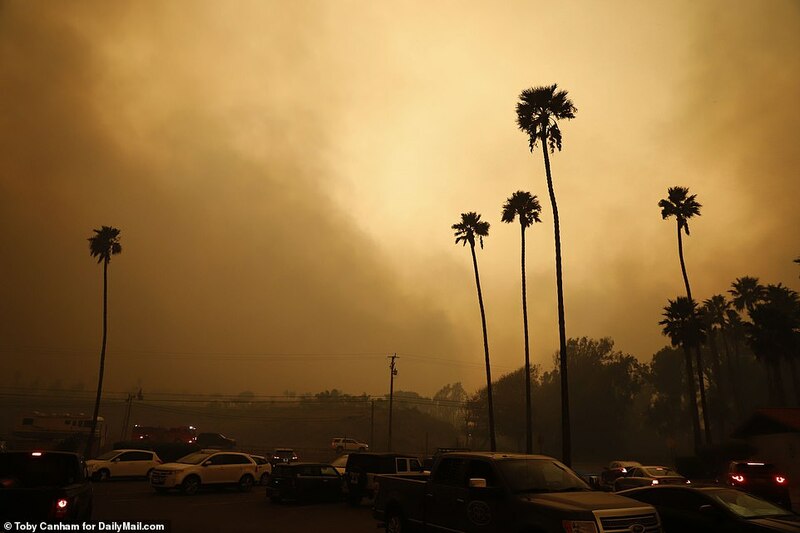 Nicole Kowalczyke, of Chico, said she stepped outside her home on Thursday around 9am to assess the menacing cloud of black smoke taking over the sky about 10 miles away from her home. As she stood outside the single piece of burnt parchment floated down from above. 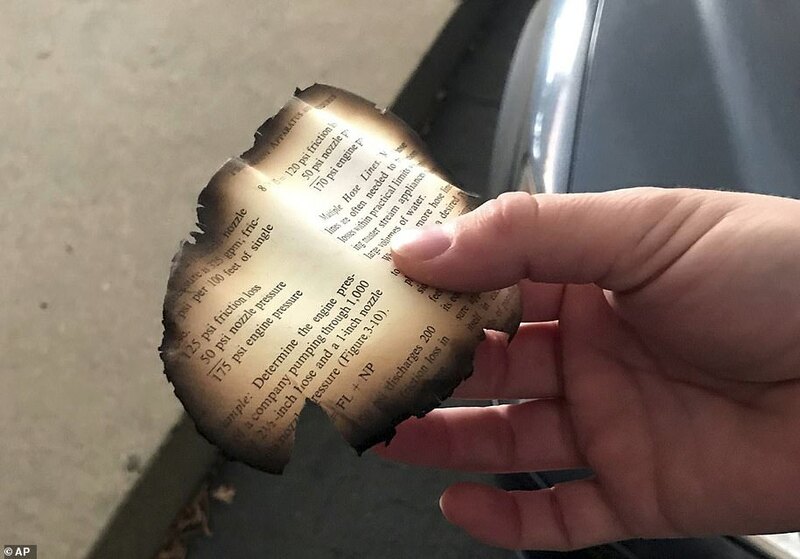 But upon a closer look she said the singed piece of paper appeared to be from a fire manual and included information about fire hose pressure. The picture racked up more than 500 likes with some Twitter users saying the paper looked like a 'holy message'. 'Wow. At least it's not a piece of a page from the #Bible. Then, I would be getting in my vehicle and heading for the ocean...' twitter user David Nyro wrote. 'Dang...don't scare me....there for a minute, I thought it was the Constitution,' one Twitter user wrote. 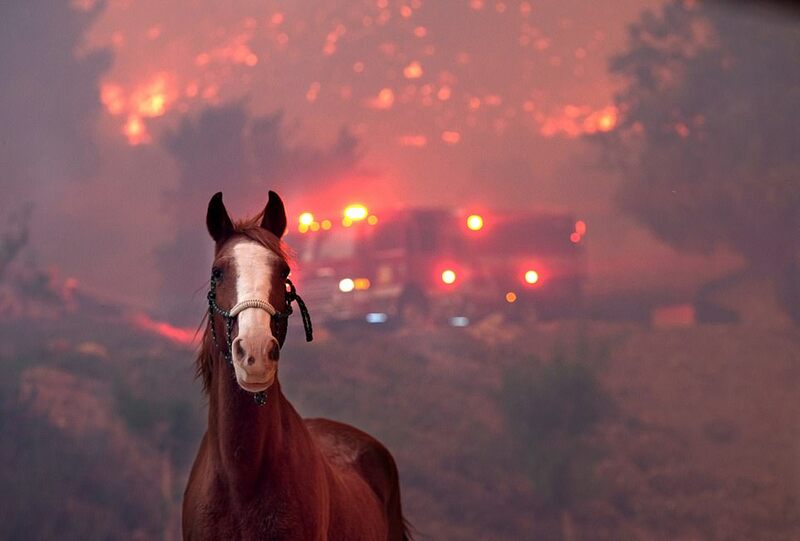 'That's a poignant photo. Hope you aren't too close,' another added. 'This is disconcerting to see. 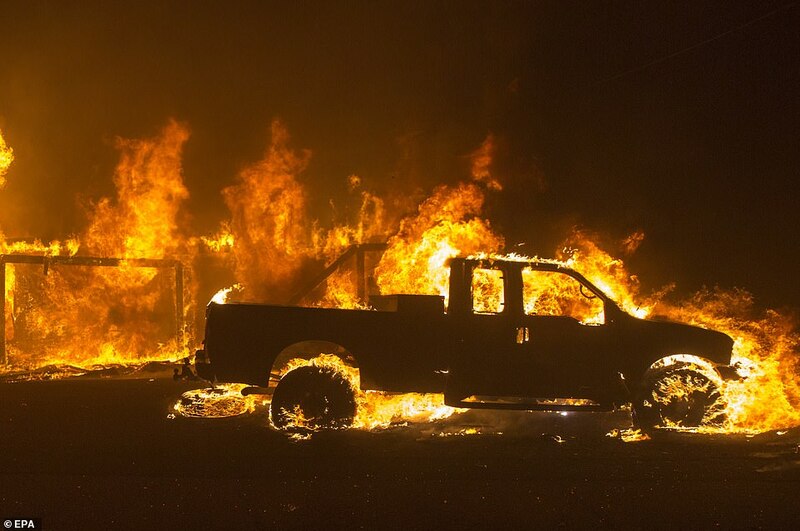 Burned debris falling from sky from #CampFire is a page from a fire truck manual,' yet another Twitter fan said. Some online users said they had eerily similar incidents happen to them. 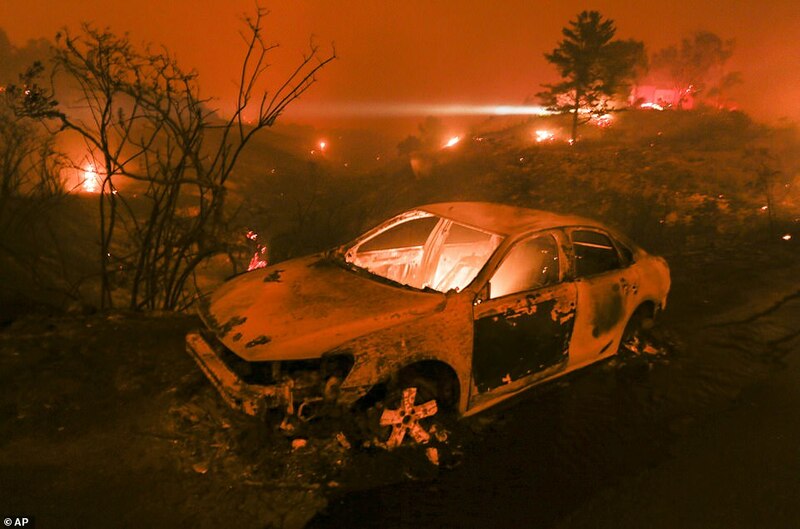 'I'll never forget that happening years ago during the huge Oakland fires. 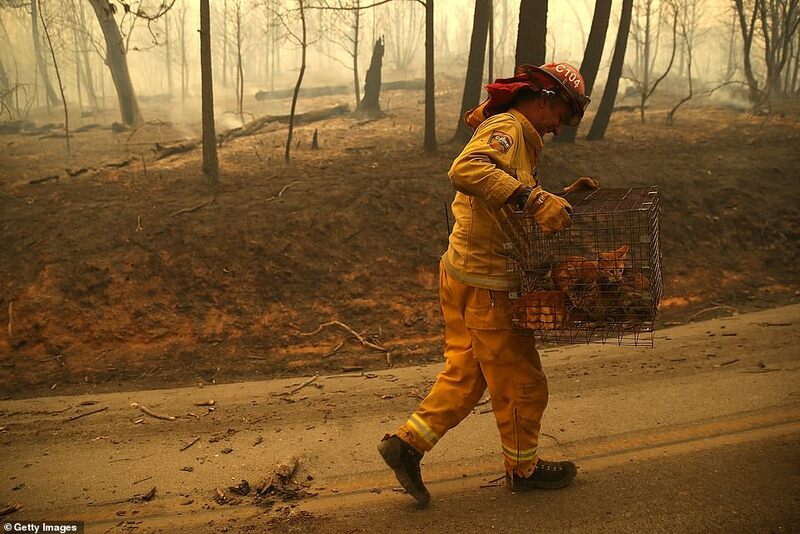 Just heartbreaking,' Twitter user Kim O'Connor said. Meanwhile, families in search of missing loved ones have received aid from an unlikely source: actor James Woods. 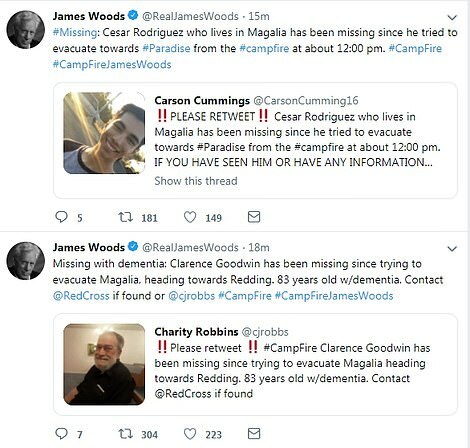 The award-winning actor has filled his Twitter page -@RealJamesWoods - with retweets of nearly 20 posts from relatives pleading for information about their missing loved ones. 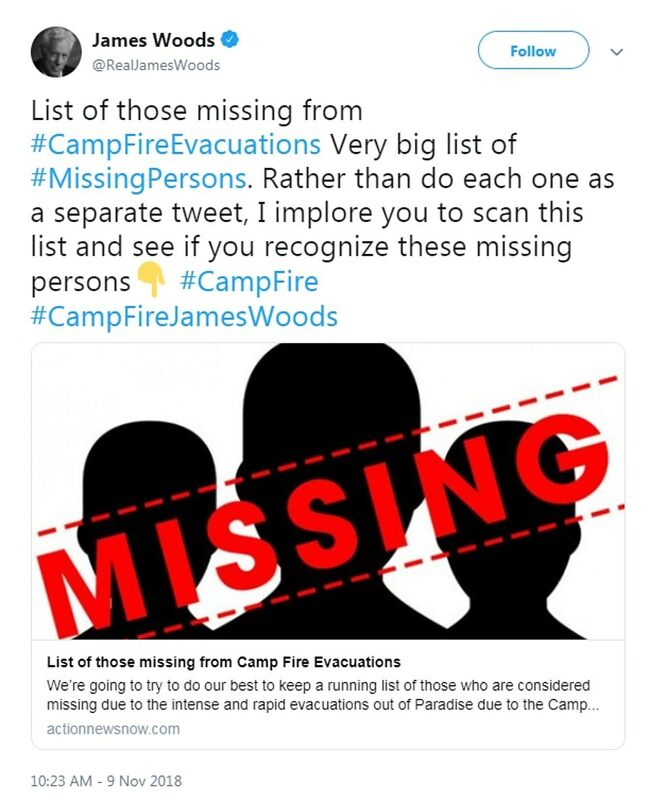 At the top of the profile Woods pinned a link to a running list of missing persons, which stood at a total of 40 as of 10am PST Friday morning. Studio City is quite a distance away. Just north of Melrose Avenue (and Craig's) It's Me. 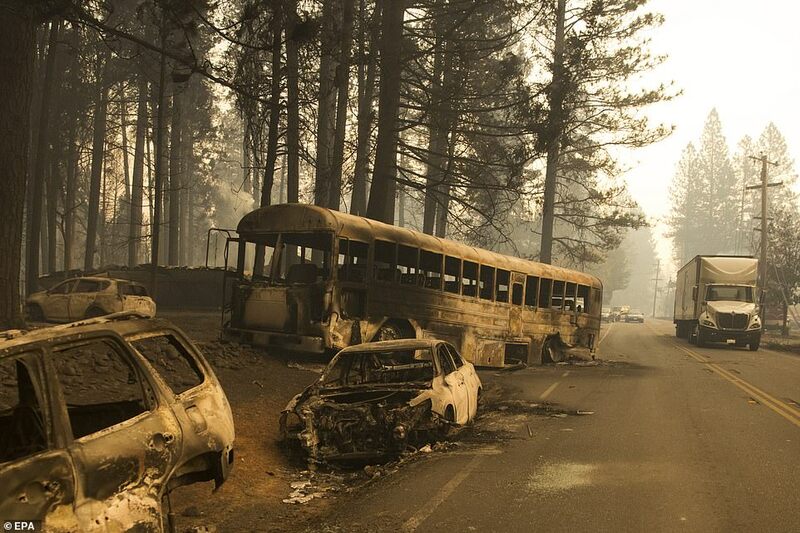 Probably not in danger from the fire - at least not yet, but I would think twice about staying there with the kids. 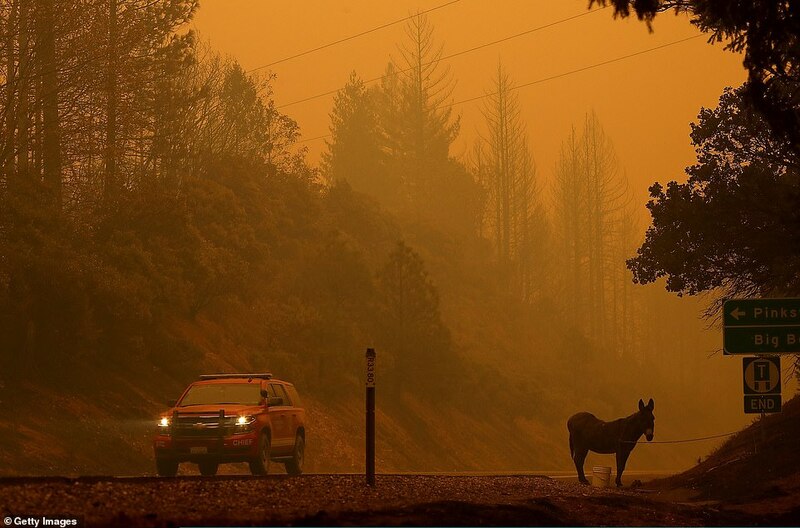 The air quality can't be very good with all the smoke and ash. I was just going to ask about Cindy and Rande. I wasn't sure they still had that house. 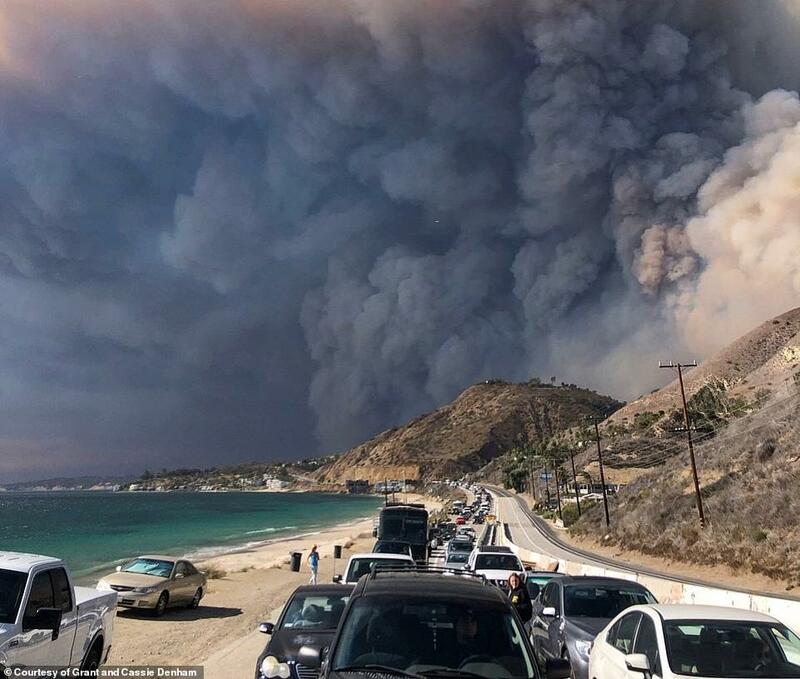 It seems like the fire's doing a lot of damage in Malibu so I'm surprised they haven't mentioned it. Maybe they're staying with G&A. party animal - not! wrote: Just north of Melrose Avenue (and Craig's) It's Me. Lizzy I also thought Rande and Cindy moved to Canada permanently. And Amal is in New York city. George's house is less than twentyminutes from Craig's. Have a look on a map. Maybe by helicopter. I've seen them land in that area. PAN - Totally confused. 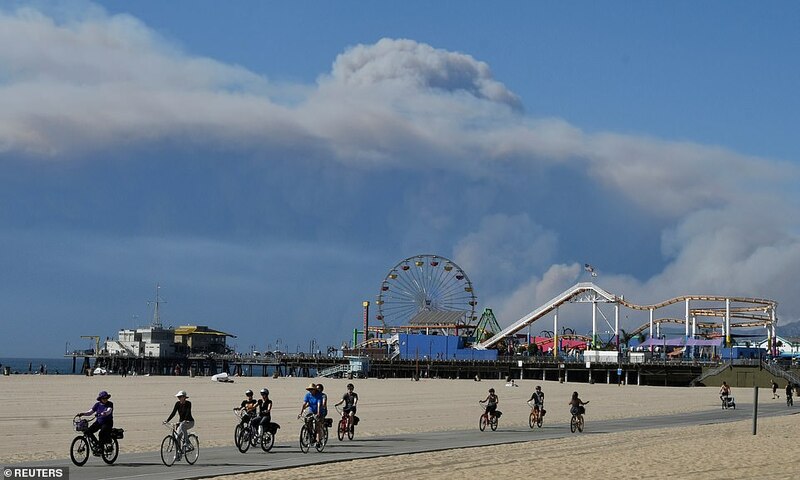 I thought Malibu was evacuated. Why on earth would they still be there?! 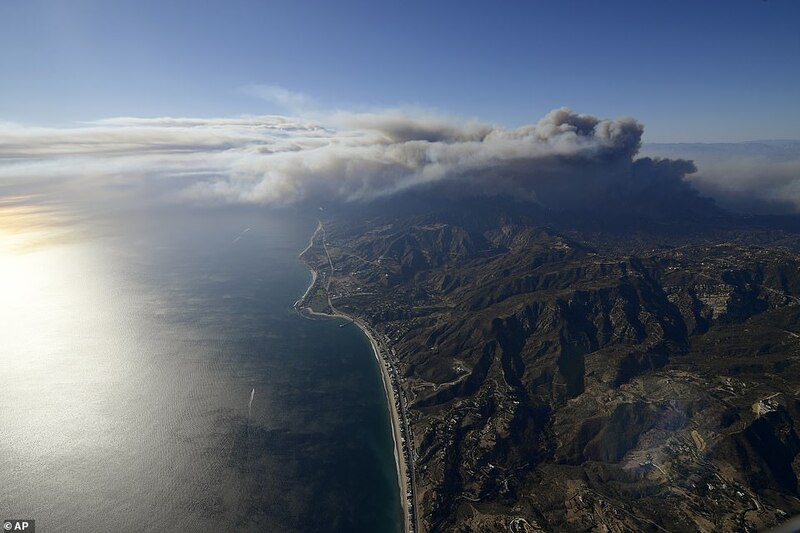 There are two fires in the Malibu/LA vicinity. 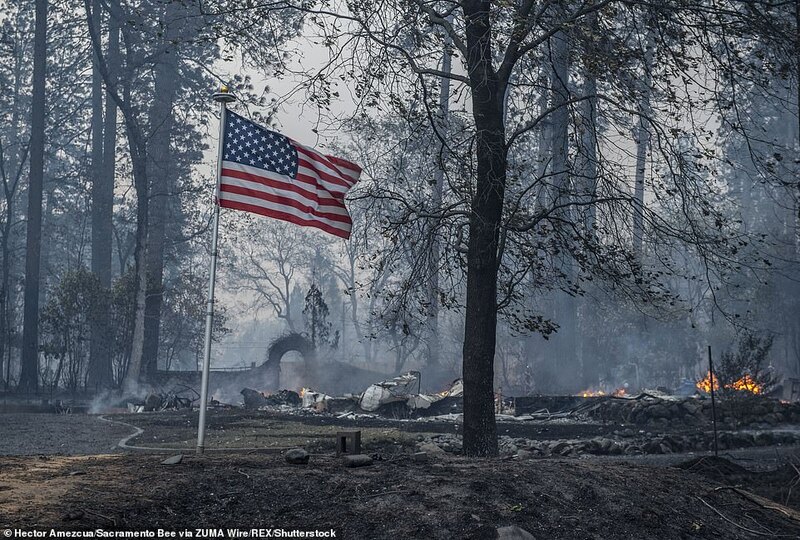 George isn't in the path of either one yet, but he isn't that far away and there's always the chance the fires could spread. If I were there I'd get out. Ladybug, I never thought the Gerbers had moved to Canada. That's their summer home. As for Amal, I don't know where she is, but I hope the kids aren't in LA. I have a feeling the Clooney clan will be back in Sonning early for the holidays. Oh right. Where are you seeing them from? Lizzy, see the other thread for Amal and George - left their NYC hotel. And you're right about the Gerbers. Checked their Instagram this morning but of course we all know they could do that but be anywhere else. Amal as of yesterday was in New York so the kids and George may be here as well. The kids are with Amal on the other thread she is seen carrying Alexander. I don't know where George Clooney's house is. 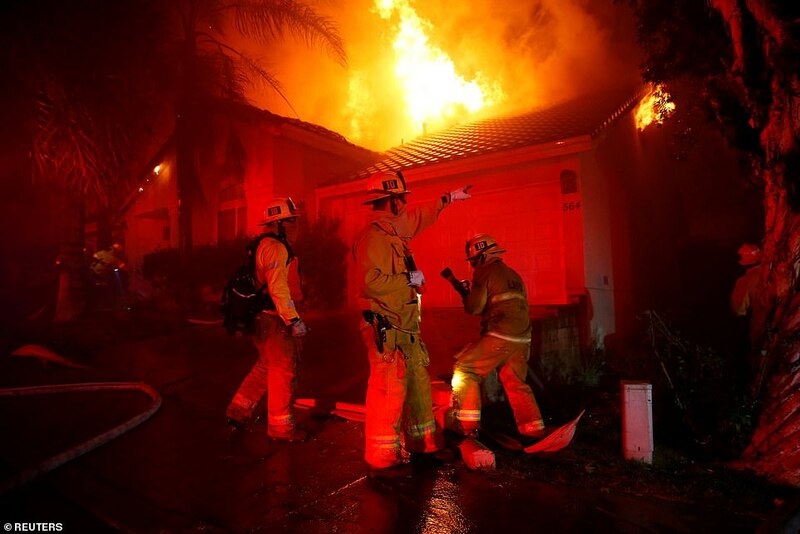 "Studio City is more than 20 minutes away from Craigs. The Craigs i saw is around the corner from Cedars. I've seen helicopters land in that area on several occasions. I think we may be talking about two different things. Right. Craig's is on Melrose Avenue. Were you there? I live here and are aware of both areas. It's interesting google clocks it at 23 minutes. Depends how fast you drive I guess. party animal - not! wrote: Depends how fast you drive I guess.